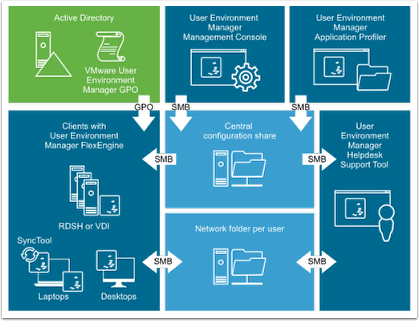 VMware User Environment Manager™ delivers personalization and centrally managed policy configurations across virtual, physical, and cloud-based Windows desktop environments. IT administrators control which settings users are allowed to personalize, and administrators can map environmental settings such as network drives and location-specific printers. User-specific Windows desktop and application settings can be applied in the context of client device, location, or other conditions. Policies are enforced when users log in, launch an app, reconnect, or when some other triggering event occurs. User Environment Manager also has a feature for configuring folder redirection for storing personal user data, including documents, pictures, and so on. The Quick-Start Tutorial for User Environment Manager helps you evaluate User Environment Manager by providing a discussion of the product and offering practical exercises. This Overview is first in the series of articles within the Quick-Start Tutorial and introduces User Environment Manager and its benefits, features, components, and architecture. Other articles in the tutorial offer hands-on exercises to set up your own proof-of-concept environment. Important: This tutorial is designed for evaluation purposes only, based on using the minimum required resources for a basic deployment, and does not explore all possible features. This evaluation environment should not be used as a template for deploying a production environment. To deploy a production environment, see the User Environment Manager Documentation. This tutorial is intended for IT administrators and product evaluators who are familiar with VMware vSphere® and VMware vCenter Server®. Familiarity with networking and storage in a virtual environment, Active Directory, identity management, and directory services is assumed. Knowledge of other technologies, such as VMware Horizon® 7 is also helpful. 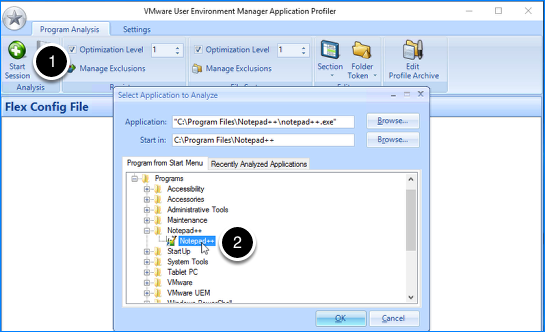 User Environment Manager can be used as a standalone product, to manage applications and Windows environment settings, or it can be used in conjunction with other VMware components. For example, User Environment Manager is a key component of JMP, the next generation of desktop and application delivery. JMP (pronounced jump), which stands for Just-in-Time Management Platform, represents capabilities in VMware Horizon 7 Enterprise Edition that deliver Just-in-Time Desktops and Apps in a flexible, fast, and personalized manner. User Environment Manager can manage applications installed in the base image of a virtual desktop machine or RDSH server, and it can manage applications provided by VMware App Volumes™. 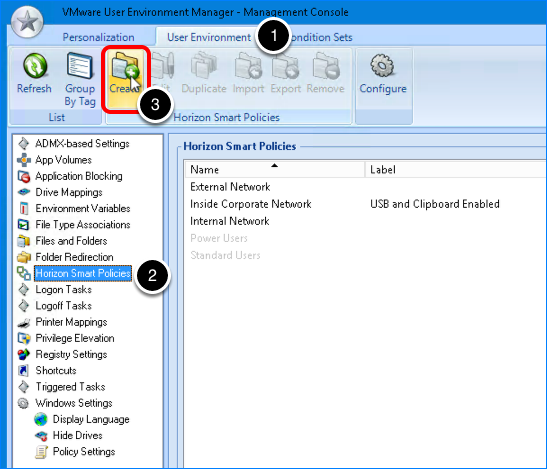 User Environment Manager also includes Horizon Smart Policies, for integrating with Horizon 7 and Horizon Apps. For more information, see the VMware Workspace ONE and VMware Horizon Packaging and Licensing guide. Following are descriptions of the core features and capabilities of User Environment Manager. In subsequent articles of this Quick-Start Tutorial, you will walk through some of these features and some advanced features, including application blocking, and privilege elevation, which allows end users to install and run applications that normally require administrator privileges. 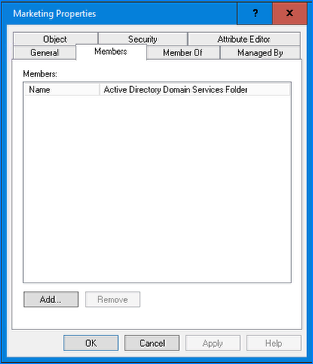 Using an Active Directory Group Policy Object with the VMware-supplied administrative templates. Specifying command-line options to use with the FlexEngine executable, which is the User Environment Manager agent. Editing the XML Flex configuration file for User Environment Manager. This strategy is called NoAD mode. You can also use a single instance of the User Environment Manager Management Console to manage multiple User Environment Manager environments. With User Environment Manager, you can specify the conditions under which an end user gets certain features, such as the ability to disable saving files to a USB device when outside the corporate network, or other security-related features. You can also configure triggering tasks to determine when to check for certain conditions, such as at login time. 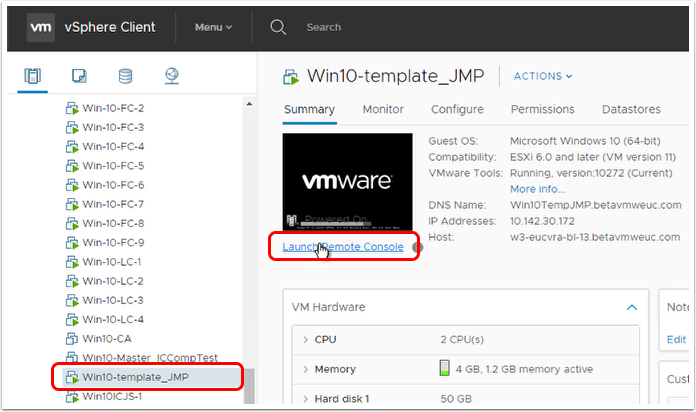 For more information, see the blog post Using VMware User Environment Manager to Manage User Profiles with Context-Based Settings. With User Environment Manager, end users can roam between disparate devices while preserving custom application settings and Windows personalization settings. When a user logs in to a virtual desktop or application, User Environment Manager reads the profile archive file for that user's profile and can, for example, display the desktop background or application settings that the user saved during the last session, regardless of whether the actual endpoint device was a desktop computer at work or an iPad at home. 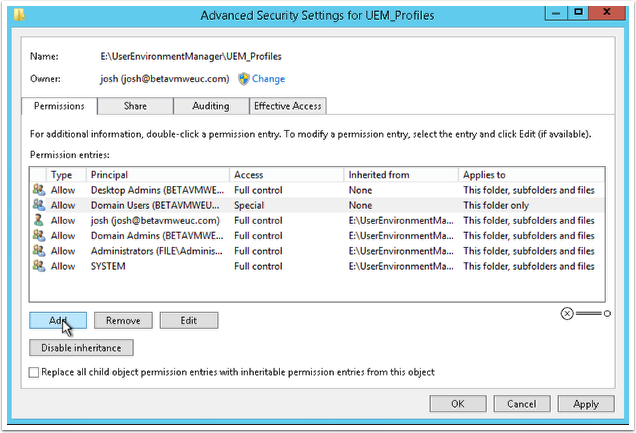 User Environment Manager takes a whitelist approach to managing the user profile. Given this design approach, IT must specify which applications and settings will be managed. Although this approach takes a little more work up front, this solution prevents excessive profile growth and profile corruption, enables user settings to roam across Windows versions, and provides IT granular control to manage as much or as little of the user experience as needed. The Easy Start feature gives you a jumpstart on the whitelist of applications and settings you want to manage. With a click of the Easy Start button, you can manage many common Windows applications, including several versions of Microsoft Office. Many Windows environment settings are also added by Easy Start. You can then easily select an application or Windows setting to review and change the default settings. 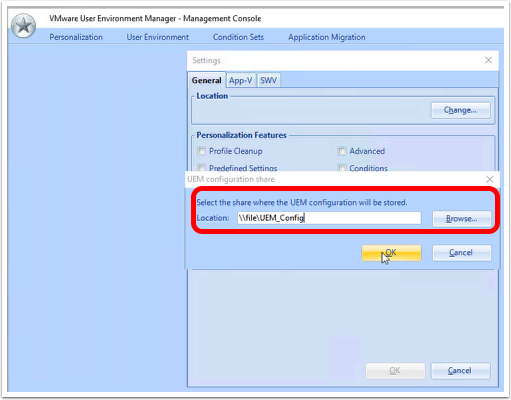 Preserving user-specific application settings and applying or enforcing specific default application settings are key features of User Environment Manager. VMware provides application management templates for commonly used software packages, and the VMware User Environment Manager Community Forum contains many more templates created with an included tool called Application Profiler. For applications that do not have a corresponding application management template, you can use the Application Profiler, a standalone application that analyzes where an application stores its file and registry configuration. The analysis results in an optimized User Environment Manager Flex configuration file, which you can edit in the Application Profiler or use directly. You can also use Application Profiler to set the initial configuration state of applications. 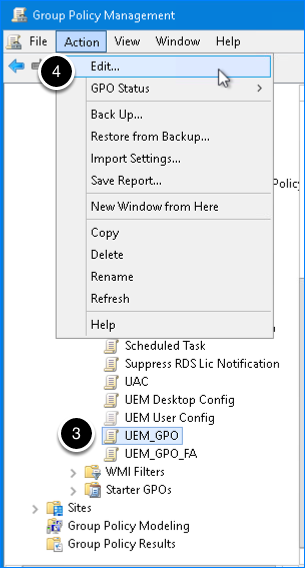 With User Environment Manager Self-Support, end users can restore application settings from a backup or reset the settings to their defaults. Reset one or more profile archives for a user. Restore a profile archive backup for a user. 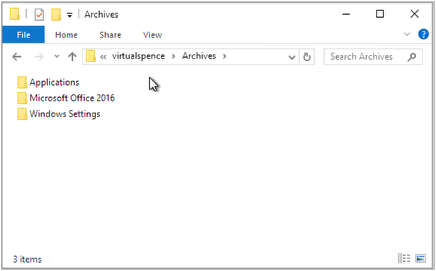 Open a profile archive for a user in Windows Explorer. Edit a profile archive for a user. View User Environment Manager agent log files for a user, and search for a specific log string. 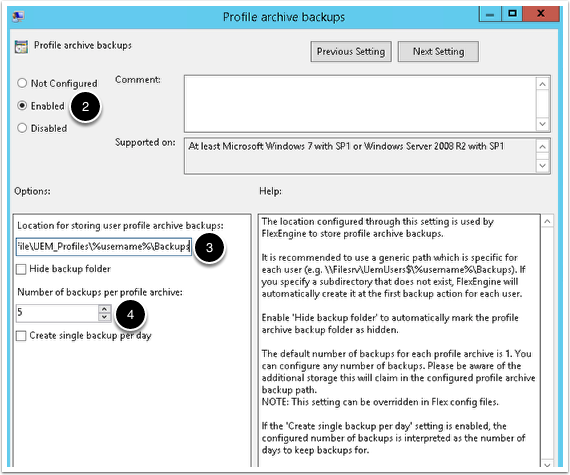 View the total size of profile archives and profile archive backups for a user. This article explains some of the most popular reasons why enterprises use User Environment Manager. End users are using more devices than ever before, and expect a consistent user experience when accessing corporate resources. As IT explores virtual desktop infrastructure (VDI), published applications, and even cloud computing to deliver these resources, User Environment Manager provides that consistent user experience through personalization. Personalization abstracts the settings and preferences from the underlying Windows operating system and applications. End users are free to roam from a physical PC to a VDI desktop, or to a cloud-hosted published application. User Environment Manager persists the look and feel of Windows and applications, providing a superior user experience. Get hands-on in the exercise Test Application Personalization. Windows logon times directly impact the end-user experience. Whether managing physical or virtual PCs, VDI, or published applications, IT constantly struggles to find a balance between customizing the Windows environment and adding time to the user logon process. Tasks such as mapping printers, mapping drives, and applying policies to manage applications often occur during the user logon process. User Environment Manager uses DirectFlex technology to remove much of this overhead from the user logon process. Instead, these tasks are carried out dynamically, if and when they are needed. Take an AutoCAD engineer as an example. The engineer has access to a shared drive that contains a variety of drawings, as well as a plotter printer. Using a typical logon script would likely map the drive and printer every time the engineer logs in to Windows, whether AutoCAD is used during the session or not. This process results in added logon time for components that are not used. 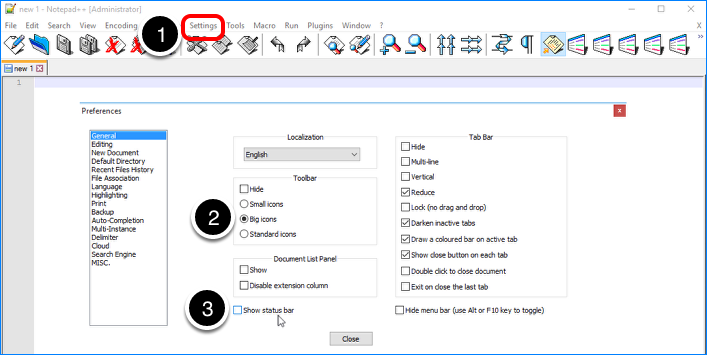 With DirectFlex, User Environment Manager can dynamically map the drive and printer when AutoCAD is launched, and disconnect them when AutoCAD is closed. By removing such operations from the logon process, logon times for end users can be reduced. 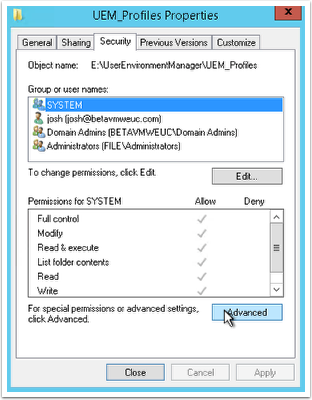 Get hands-on in the exercise Configure User Environment Settings. User Environment Manager is not just about providing enhancements for end users. Many use cases focus on improving IT operations. For example, privilege management can be a daunting task, and many IT administrators are forced to provide Local Administrator privileges to end users to satisfy application demands. With User Environment Manager privilege elevation, IT can strategically elevate permissions for application installers, as well as executables for applications already installed that require Local Administrator privileges to run. Elevating privileges for specific executables, while removing Local Administrator privileges from end users, can dramatically reduce the risk of a malware or ransomeware attack on your network. Privilege elevation is a key feature in any privilege management strategy. 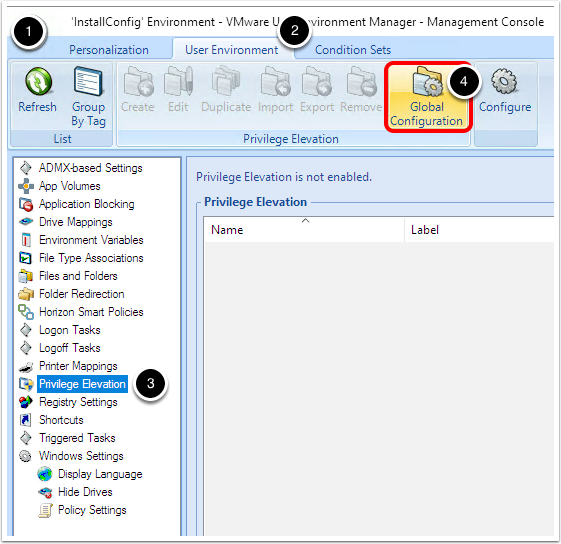 Get hands-on in the exercise Configure Privilege Elevation. As enterprises go down the path of VDI, a common question is whether to provide persistent or non-persistent desktops. Although end users enjoy the flexibility to customize their own, personal, persistent VM, IT often prefers the streamlined management of non-persistent VMs. User Environment Manager is a key component of the VMware Just-In-Time Management Platform (JMP), which provides the best of both worlds. To learn more about JMP, and the benefits User Environment Manager provides with this approach, see Deploying JMP (Just-in-Time Management Platform) in Horizon 7. Management Console – Primary application interface for IT to configure and manage User Environment Manager. FlexEngine – Agent component, which is installed on the virtual or physical machines that you want to manage. File shares – User Environment Manager relies on a folder hierarchy, which you will create in a later exercise. 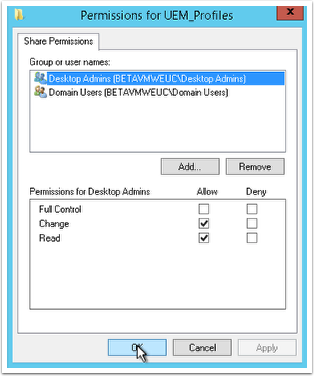 User Environment Manager stores configuration files in the configuration share. User data is stored in the profile archives share. 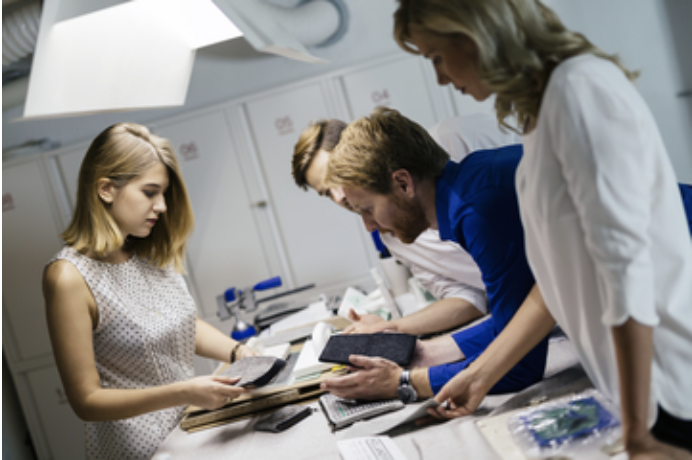 Before beginning the installation, its important to understand the terminology specific to User Environment Manager. The following User Environment Manager documentation topic, User Environment Manager Infrastructure and Terminology, provides a comprehensive list of User Environment Manager terminology. This section provides an overview of the architecture so you can see how the components relate to each other. The following figure shows the architecture of a User Environment Manager installation. In the following descriptions, you refers to you, the IT administrator. All components of User Environment Manager that you deploy communicate between each other by using the SMB protocol. User Environment Manager GPO – You create a GPO for each Active Directory organizational unit (OU) you want to manage. The OU typically contains the computer objects for virtual machines you want to manage. 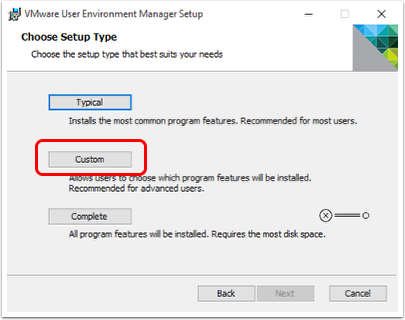 You can then edit this GPO and apply User Environment Manager settings from administrative templates included in the User Environment Manager installation package. User Environment Manager Management Console – You use this User Environment Manager administrative UI to configure application settings, Windows environment manager settings, conditions under which the settings go into effect, and various other configuration settings and Horizon Smart Policies for things like printer mapping, attaching devices to the virtual desktop or application, and the ability to copy and paste text. User Environment Manager Application Profiler – For the few applications for which you cannot find an already-created application template, you can use this standalone application that analyzes where the application stores its file and registry configuration, and also set the initial configuration state of the application. Central configuration share – You create this file share to store the Management Console configuration and User Environment Manager configuration files. The User Environment Manager agent (FlexEngine) on virtual desktops and RDSH servers reads the configuration file on this share and applies the settings specified in the configuration file. 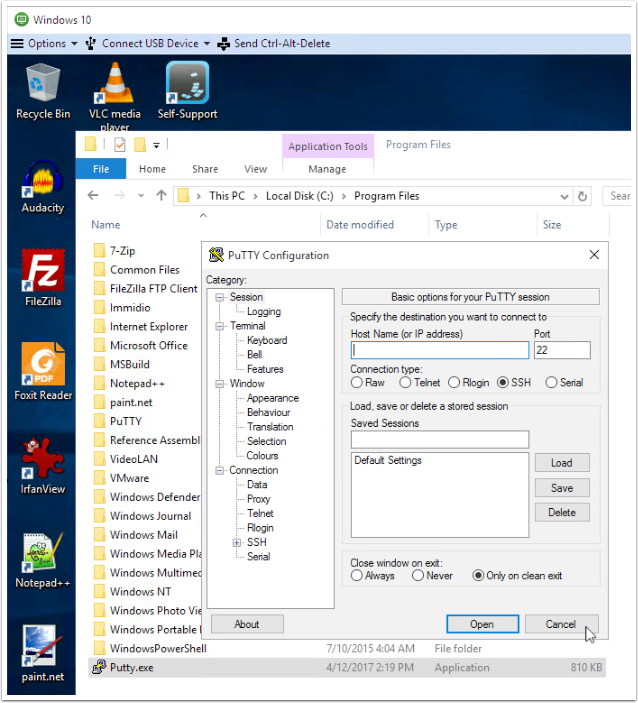 Network folder per user – In this file share that you create, each folder, or profile archive, contains ZIP files where the User Environment Manager agent (FlexEngine) stores the personalized settings of a user. For each User Environment Manager (Flex) configuration file that you create, FlexEngine creates a profile archive for each user. User Environment Manager Helpdesk Support Tool – This tool provides capabilities to support and maintain the User Environment Manager profile archives and profile archive backups. Clients with User Environment Manager FlexEngine – The agent software, FlexEngine, runs on each virtual desktop or RDSH server whose applications are to be managed. This agent reads the centralized configuration file, applies User Environment Manger settings, and saves those user settings that end users are allowed to control. In this client-server architecture, the FlexEngine agent software plays the client role, and the User Environment Manager Flex configuration file plays the server role. SyncTool – Laptop users who are not always connected to the corporate network need access to their User Environment Manager configuration files while offline. SyncTool makes all VMware User Environment Manager configuration files available locally and synchronizes changes when users connect to the corporate network. Additionally, users with a slow WAN connection can use local User Environment Manager configuration files, thus limiting network traffic and avoiding continuously roaming personal settings. The exercises in this Quick-Start Tutorial provide step-by-step guidance on completing each of the tasks outlined here, in the topic Overview of the User Environment Manager Deployment. Before you can deploy User Environment Manager, you must verify that the Windows operating system versions and, optionally, the virtualization software you plan to use, meet certain requirements, as described in the following topic, Software Requirements. 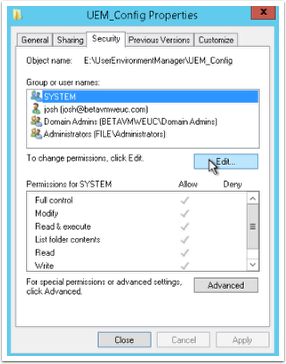 The User Environment Manager configuration share is a central share on a file server. It contains all the configuration files for personalization and application configuration management. The FlexEngine agent on the managed machine reads configuration data from the User Environment Manager configuration share when a user logs in or logs out of the environment, or when the user opens or closes applications that are configured with DirectFlex. To complete this exercise, you will need the following. An Active Directory group containing one or more end-user accounts. 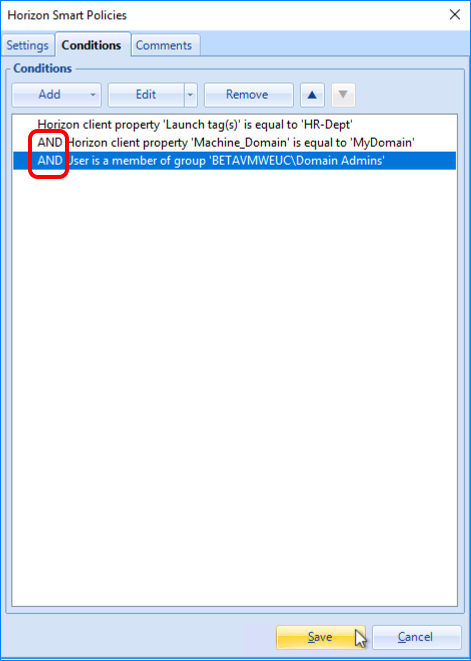 In this exercise, the AD group Domain Users is used. An Active Directory group containing one or more IT Administrator accounts. 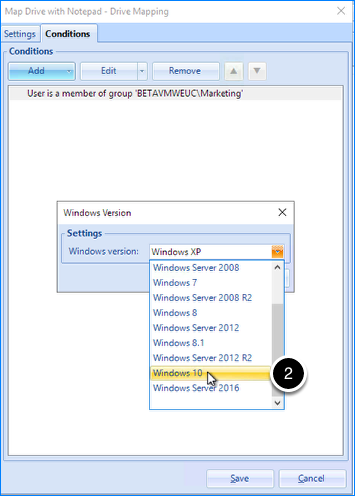 In this exercise, the AD group Desktop Admins is used. A file server with a certain amount of storage and network connection speed, as described in the following User Environment Manager Configuration Share section. 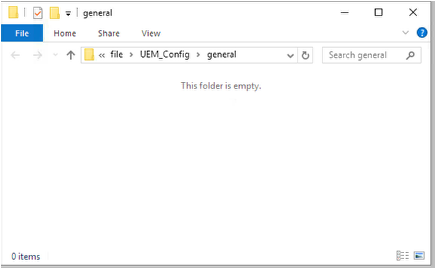 On a file server, create a folder titled UEM_Config. 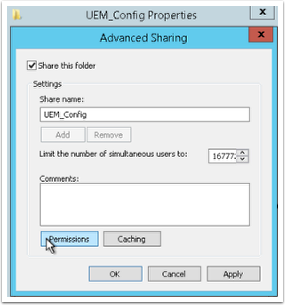 To configure sharing, right-click the UEM_Config folder and select Properties. On the Sharing tab, select Advanced Sharing. 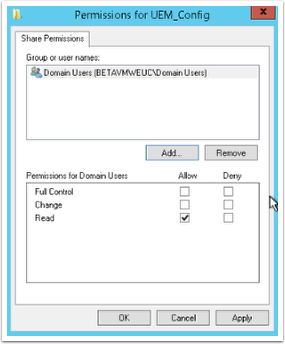 Select Permissions to configure the share permissions. 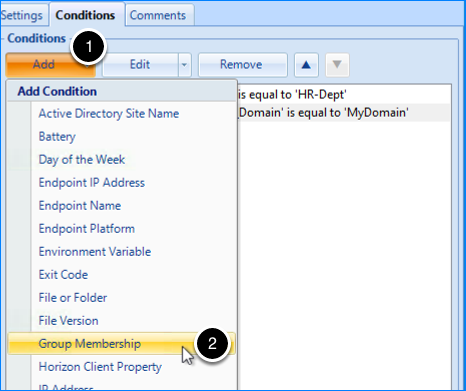 Select the Read check box for the Domain Users group, or whichever group you selected in Configuration Share Prerequisites. Select the Read and Change check boxes for the Desktop Admins group, or whichever group you selected in Configuration Share Prerequisites. In the UEM_Config Properties dialog box, on the Security tab, select Edit. In the Group or user names list, select the Desktop Admins group. In the Permissions for Desktop Admins list, select Full Control. In the Group or user names list, select the Domain Users group. In the Permissions for Domain Users list, select Read & execute. After you select Read & execute, the List folder contents and Read check boxes are automatically selected. The following Config Share video provides a detailed demonstration of the steps outlined in this exercise. If you need additional detail, you can find it here. If you already have a configuration share, feel free to skip the video. This video is 2 minutes. The profile archives share stores the personal settings for users. The User Environment Manager agent (FlexEngine) creates a subfolder for each user. The share contains User Environment Manager profile archives, which are ZIP files. FlexEngine reads personal user settings from the profile archives share when a user logs in to the environment or launches a DirectFlex-enabled application. FlexEngine writes the modified settings when the user logs out, or closes a DirectFlex-enabled application. To complete this exercise, you need the following. This should be the same group you used in Configuration Share Prerequisites. 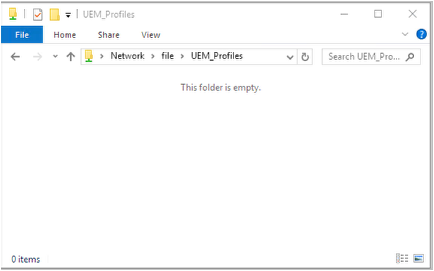 On a file server, create a folder titled UEM_Profiles. 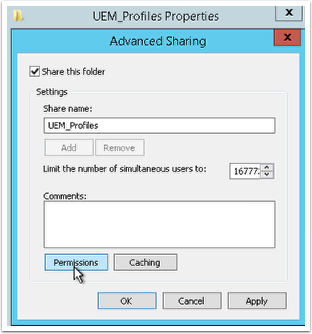 To configure sharing, right-click the UEM_Profiles folder and select Properties. Select the Read and Change check boxes for the Domain Users group, or whichever group you selected in Profile Archives Share Prerequisites. Select the Read and Change check boxes for the Desktop Admins group, or whichever group you selected in Profile Archives Share Prerequisites. 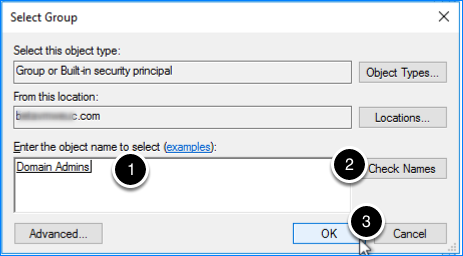 In the UEM_Profiles Properties dialog box, on the Security tab, select Advanced. 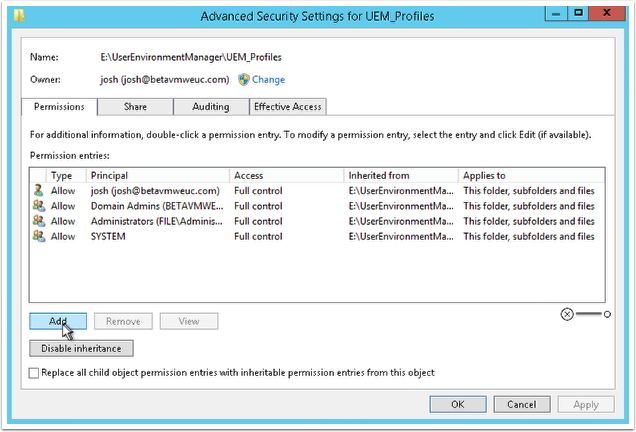 In the Permission Entry for UEM_Profiles dialog box, click Select a principle, and add the Desktop Admins group as a principal. Verify that Desktop Admins is listed as the principal. Verify that the Applies to drop-down list is set to This folder, subfolders and files. Select the Full control check box. 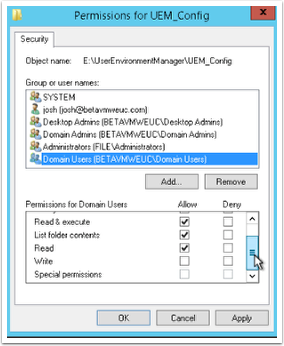 In the Permission Entry for UEM_Profiles dialog box, click Select a principle, and add the Domain Users group as a principal. Verify that Domain Users is listed as the principal. Select the Read & execute, List folder contents, and Read check boxes. Verify that the Applies to drop-down list is set to This folder only. Select the Traverse folder / execute file, List folder / read data, Read attributes, Read extended attributes, Create folders / append data, and Read permissions check boxes. 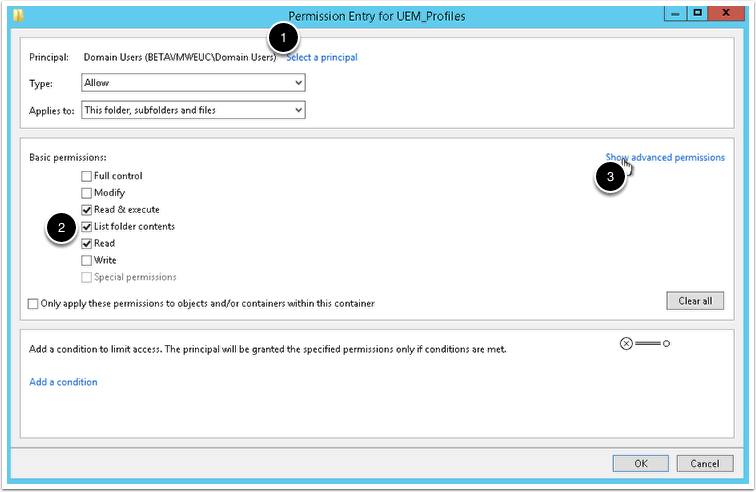 In the Permission Entry for UEM_Profiles dialog box, click Select a principle, and add the Creator Owner account as a principal. Verify that Creator Owner is listed as the principal. Set the Applies to drop-down list to Subfolders and files only. 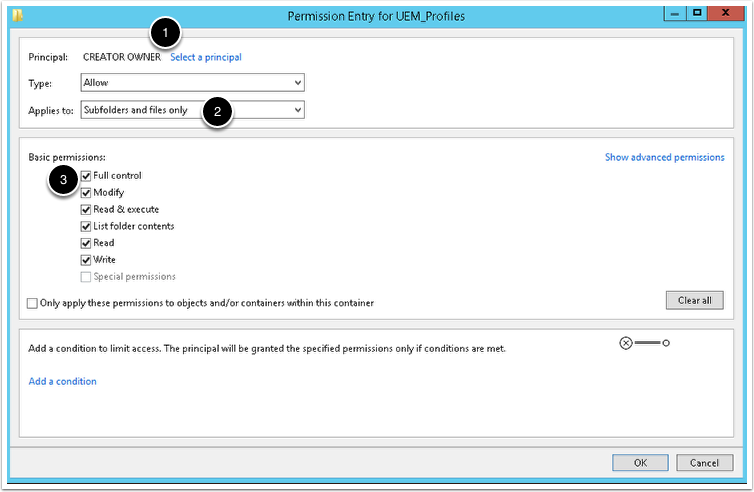 The NTFS permissions for the UEM_Profiles folder should look like this. The following Profile Share video provides a detailed demonstration of the steps outlined in the previous section. If you already created the configuration share, feel free to skip the video. If you need additional detail, you can find it here. This video is 2 minutes. 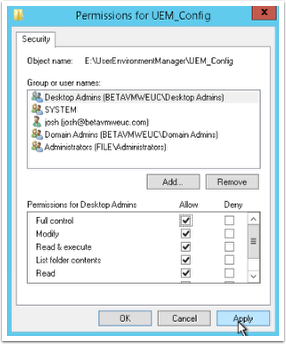 FlexEngine, the User Environment Manager agent component, applies the policies that the IT administrator creates with the User Environment Manager Management Console. FlexEngine can be installed on physical, virtual, and cloud-based Windows devices. To install this component, you run the same VMware User Environment Manager Setup wizard that you will run later, to install the management console. If you plan to create pools of virtual desktops or farms of RDSH servers, you can install FlexEngine on the master VM before creating the pool or farm. 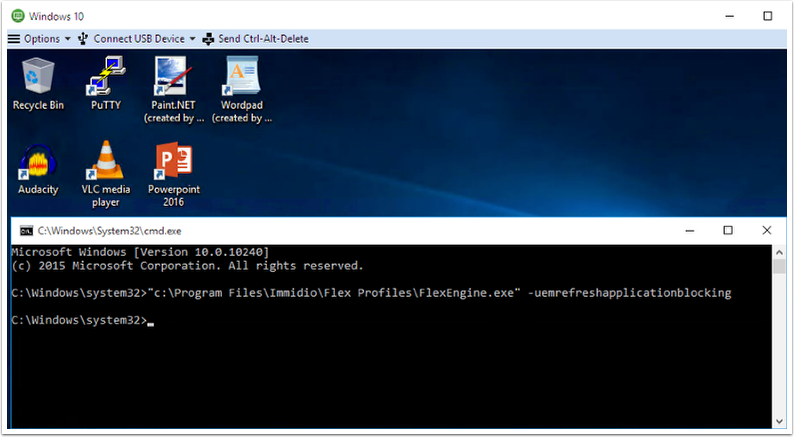 For example, in the following exercise, FlexEngine is installed on a Windows 10 virtual machine, referred to as the template VM. This template VM is later used to create a pool of Horizon 7 instant-clone desktops. User account – When you log in to the OS to run the installer, the account you use must have administrative privileges. Installer – If necessary, you can download the installer from the Product Evaluation Center or the VMware Downloads page. The installer is an architecture-specific (x86 or x64) MSI file. License – The installation wizard prompts for the path to a valid license file unless VMware Horizon Agent is already installed in the VM. (User Environment Manager is included with Horizon 7 Enterprise Edition.) See Licensing Requirements. Windows Registry – The Windows Registry on the VM must be accessible to User Environment Manager so that new entries can be written. See Registry Access Requirements. Internet access – The installation process includes a certificate revocation check to verify the digital signature of the MSI file. This check requires Internet access. Windows OS – The machine must be running a supported Windows version. For the example in this exercise, Windows 10 is used. Note: For the purposes of this exercise, you can install the agent on a physical or a virtual machine that you want to manage. For details about how to create a VM used for virtual desktops for RDSH hosts in a VMware Horizon 7 setup, see Preparing Virtual Machines for Desktop Pools, part of the Reviewer’s Guide for View in Horizon 7 series. Following is a list of supported operating systems, taken from Software Requirements. For this example, we downloaded the installer to a template VM hosted on a VMware ESXi™ server. 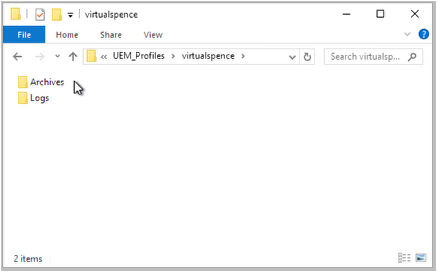 To connect to this VM, called Win10-template_JMP, you would select the VM in the inventory list and select Launch Remote Console. If you are performing this exercise in your own lab, you can download and extract the User Environment Manager installer file, and copy the file to the system where it will run or to a location accessible to the system. 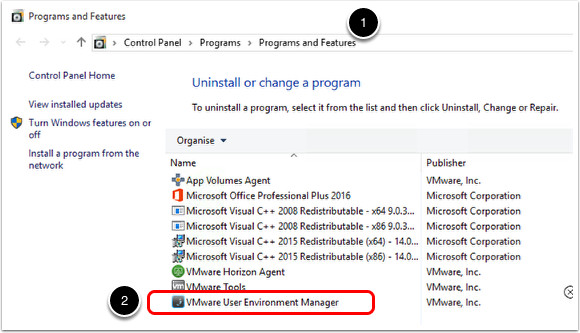 Browse to the location of the User Environment Manager installation package. Double-click the installer file to start the wizard, and follow the prompts. Select Custom to review the installation options. The VMware UEM FlexEngine agent component is selected, along with the optional components: Application Migration and Self-Support. Select Next and follow the rest of the prompts to complete the wizard. Navigate to the Programs and Features control panel. Verify the VMware User Environment Manager agent was successfully installed. The following Install FlexEngine video provides a detailed demonstration of the steps outlined in this section. If you need additional detail, you can find it here. If you already installed FlexEngine, feel free to skip the video. This video is 2 minutes. You use this administration console to configure User Environment Manager and to manage personalization and application configuration settings for end users. You can install the User Environment Manager Management Console on any supported Windows desktop or server that you want to use for managing User Environment Manager. 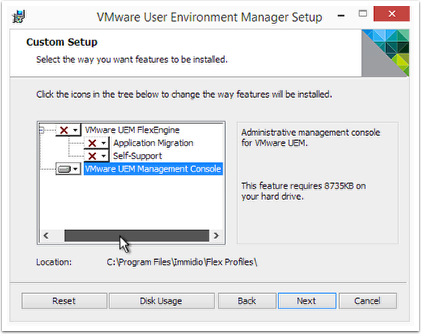 To install this component, you run the same VMware User Environment Manager Setup wizard that you ran to install the User Environment Manager agent (FlexEngine). User account - When you log in to the OS to run the installer, the account you use must have administrative privileges. Installer - If necessary, you can download the installer from the Product Evaluation Center. The installer is an architecture-specific (x86 or x64) MSI file. Windows OS - The system must be running a supported Windows version. See Software Requirements. Internet access - The installation process includes a certificate revocation check to verify the digital signature of the MSI file. This check requires Internet access. Download and extract the User Environment Manager installer file, and copy the file to the system where it will run or to a location accessible to the system. 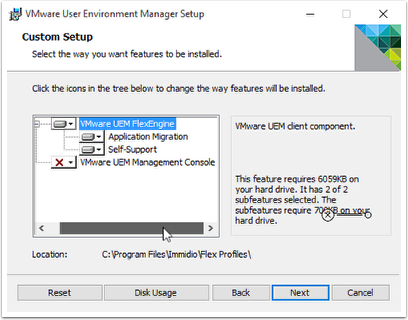 Disable the VMware UEM FlexEngine components and enable the VMware UEM Management Console component. Follow the rest of the prompts to complete the wizard. 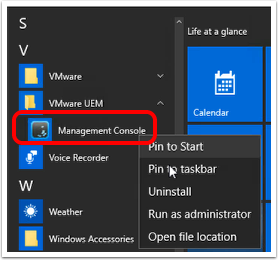 A VMware UEM Management Console shortcut appears on the Start screen. The following Install Management Console video provides a detailed demonstration of the steps outlined in this section. If you need additional detail, you can find it here. If you already installed the User Environment Manager console, feel free to skip the video. This video is 1 minute. The first time you start the User Environment Manager Management Console, you are prompted to supply the path to the file share you set up in Create and Configure the User Environment Manager Configuration Share. Configuring the console consists of entering this file path and either accepting the default configuration or making changes by selecting or deselecting check boxes. From the Start screen, start the User Environment Manager Management Console. When the console opens, in the Location text box, browse to or enter the UNC path to the configuration share; for example, \\file\UEM_Config is the path if the name of the file server is file and the name of the share folder is UEM_Config. If you have not already set up a configuration share, see Create and Configure the User Environment Manager Configuration Share. 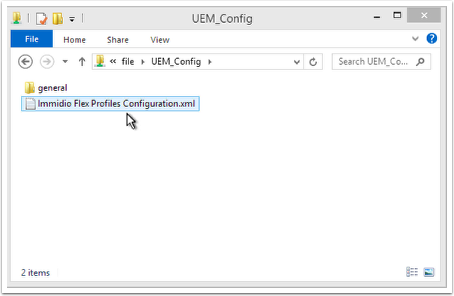 Browse to the UEM_Config folder on the file share and verify that the management console configuration file has been created. The next time you open the console, this configuration file is read. You are not prompted to supply the path again. Accept the default general configuration settings or use the check boxes to enable the desired features. To learn more about these features, see the VMware User Environment Manager Administration Guide. The App-V and SWV tabs contain settings for Microsoft Application Virtualization support and Symantec Workspace Virtualization support, respectively. The following Management Console Config video provides a detailed demonstration of the steps outlined in this section. If you need additional detail, you can find it here. This video is 1 minute. 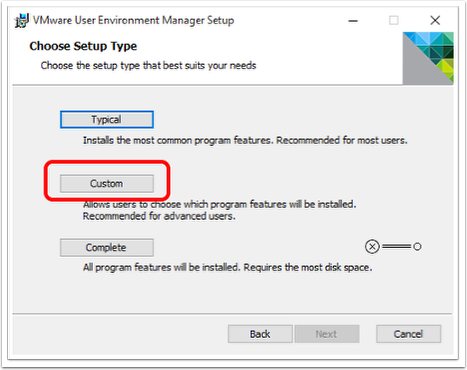 After installing User Environment Manager, you have a couple of options for configuration. You can use the VMware-provided administrative templates for Active Directory Group Policy Objects, or you can use the XML-based option called NoAD mode. This section assumes you have chosen to use AD GPOs. The FlexEngine GPO has required and optional settings, and provides administrators with the flexibility to manage multiple environments. The following Configuring the FlexEngine Group Policy Object topic provides additional detail on the configuration options for the FlexEngine Group Policy Object. To configure settings for end users, you can use the administrative templates that are provided in the download package. You must copy the administrative template files to the correct folder on the domain controller. The Administrative Templates (ADMX) folder is included in the same download package that contains the User Environment Manager installer. If necessary, you can download this package from the VMware Download page. Select and copy all the ADMX files inside the Administrative Templates (ADMX) folder. Paste the files in the PolicyDefinitions folder on the domain controller. The location of this folder might vary, but often the location is C:\Windows\PolicyDefinitions. In this path, <PDC-name> is the name of the primary domain controller, and < domain-name> is the fully qualified DNS name of the domain in which the domain controller is located. 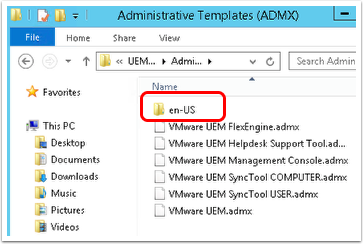 Open the en-US folder included in the Administrative Templates (ADMX) folder. Select and copy all the ADML files in the en-US folder. 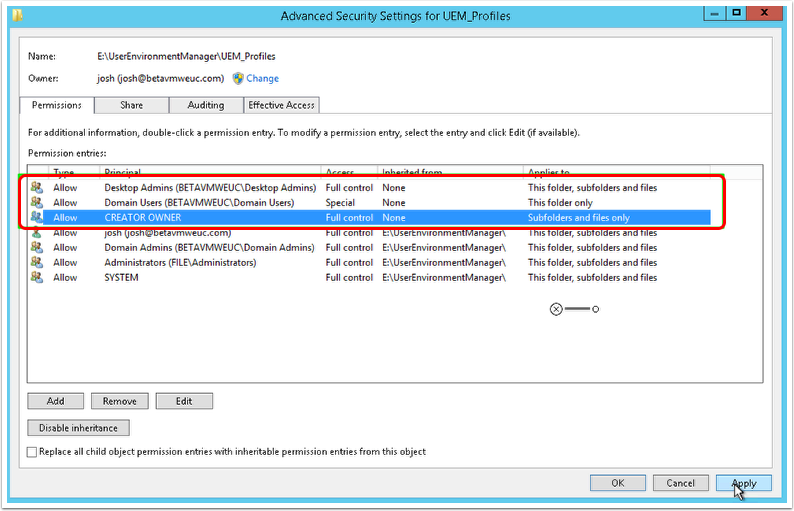 Paste the ADML files into the en-US folder inside the PolicyDefinitions folder on the domain controller. The location of this folder might vary, but often the location is C:\Windows\PolicyDefinitions\en-US. The following ADMX video provides a detailed demonstration of the steps outlined in this section. If you need additional detail, you can find it here. If you already installed the ADMX and ADML files, feel free to skip the video. This video is 1 minute. Now that you have copied the User Environment Manager administrative templates to the correct location on the domain controller, you can create a GPO and use the templates with this GPO. 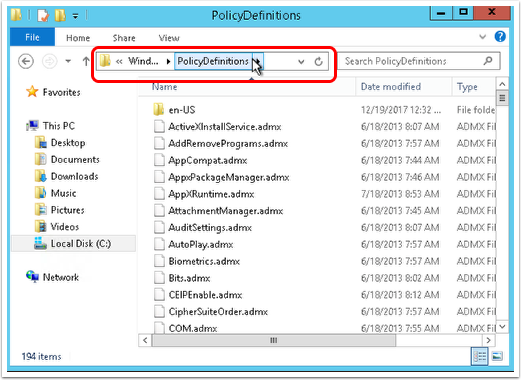 In this exercise, you configure all the required policy settings to enable User Environment Manager, and you create some optional policies. Enable FlexEngine to wait for the network at computer startup and logon – (Required) This computer-based setting ensures that FlexEngine (that is, the User Environment Manager agent) Group Policy client-side extension runs every time a user logs in. If this extension does not run, User Environment Manager settings cannot be applied. Enable Group Policy loopback processing mode – This computer-based setting is necessary because the GPO is applied to an OU containing computer rather than user objects. Set the path to the User Environment Manager configuration share – (Required) This user-based setting is necessary so that the agent can read the configuration file and apply the appropriate application and environment settings for the end user. 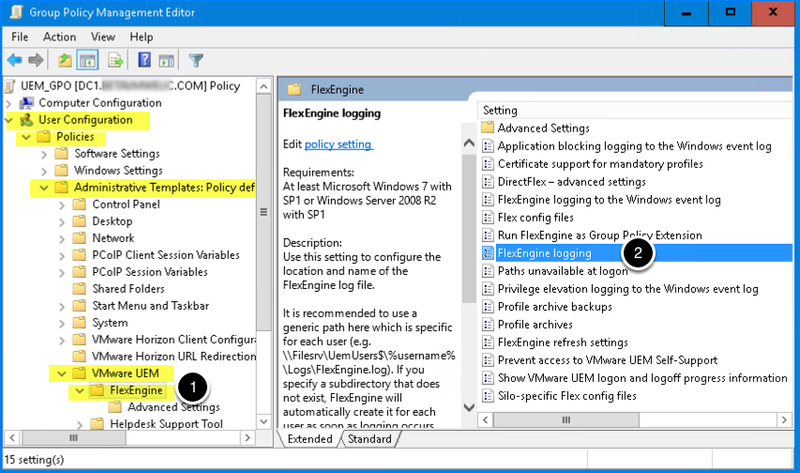 Enable the FlexEngine to run as a Group Policy extension – (Required) With this user-based setting enabled, the settings that User Environment Manager manages are applied earlier during the login phase than if FlexEngine were instead run from a login script. Set the path to the Profile Archives share – (Required) This user-based setting is necessary so that the agent can read the archive settings for a specific user to apply the correct profile. The agent also saves user settings in this folder. Set the path to the Profile Archives backups – With this user-based setting, you can specify the location and number of backups to retain. Enable FlexEngine logging – With this user-based setting, you can specify the location, logging level, and file size of the log file for the User Environment Manager agent. Enable a logoff script – (Required) With this user-based setting, you specify a command-line command so that when a user logs out, FlexEngine reads the settings configured through the User Environment Manager Group Policy Object and stores the settings. You have completed all the Installation exercises, and you know the paths to the User Environment Manager configuration share and the profile archives share. The User Environment Manager ADMX and ADML files are placed on the domain controller, as described in Copy the Administrative Templates to the Domain Controller. You have credentials for a computer that can access the Microsoft Group Policy Management Console (GPMC) and the domain controller. There are a number of ways to configure and apply GPOs. This exercise provides only one example. Browse to an OU containing the computer object that contains your virtual desktops. Create a new GPO, and link it to this OU. 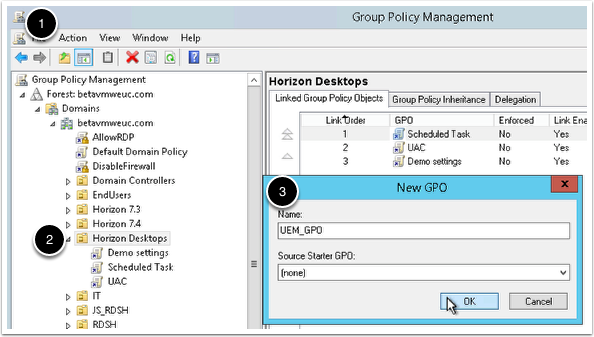 Edit the new GPO in the Group Policy Management Editor. Navigate to Computer Configuration > Policies > Administrative Templates > System > Logon. Edit the policy setting Always wait for the network at computer startup and logon and set it to enabled. 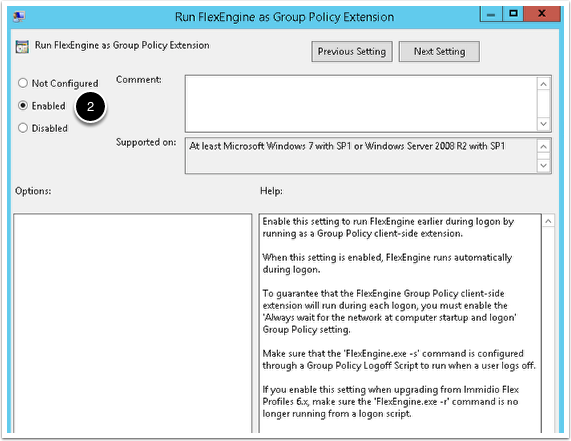 This setting ensures that the FlexEngine Group Policy client-side extension runs every time a user logs in. For more information, see Troubleshoot GPO Settings. Navigate to Computer Configuration > Policies > Administrative Templates > System > Group Policy. 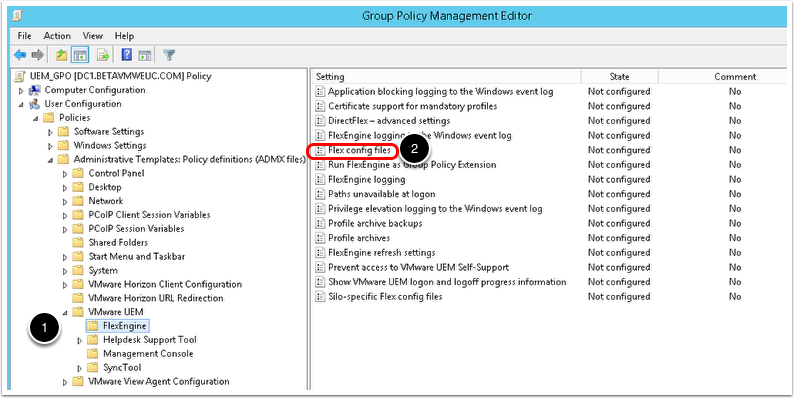 Edit the policy setting Configure user Group Policy loopback processing mode and set it to enabled. 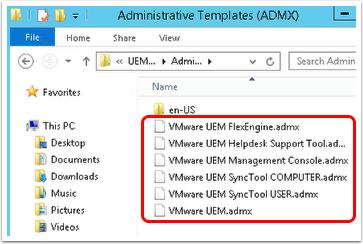 Navigate to User Configuration > Administrative Templates > VMware UEM > FlexEngine. Double-click the Flex config files policy setting. 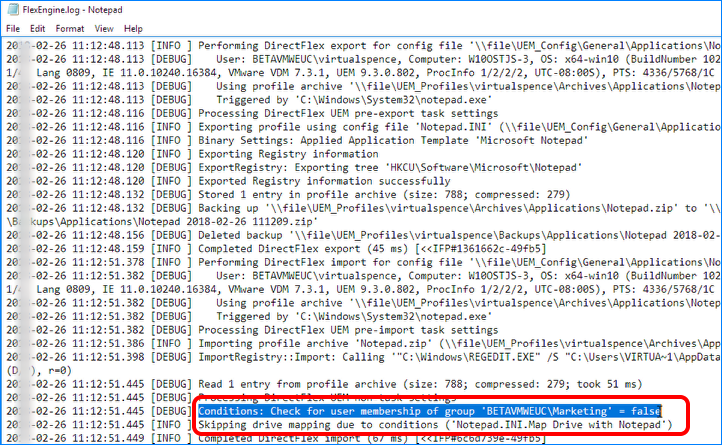 Note: If you cannot find the VMware UEM FlexEngine policies, verify that you copied the administrative templates to the correct location, as described in Copy the Administrative Templates to the Domain Controller. Enable the policy. This is a mandatory setting to enable FlexEngine. 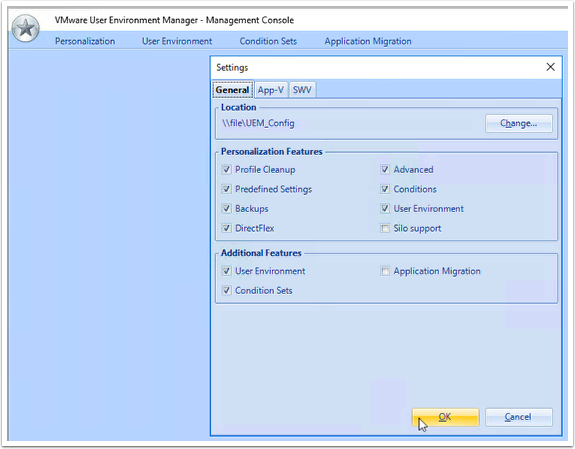 Provide the path to the configuration share you created as part of the exercise Create and Configure the User Environment Manager Configuration Share. Be sure to append General to the end of the path because this folder is automatically created by User Environment Manager. 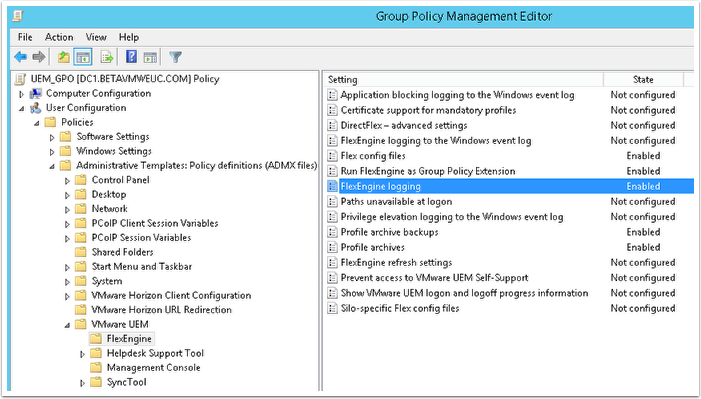 In the Group Policy Management Editor dialog box, navigate to User Configuration > Administrative Templates > VMware UEM > FlexEngine, and double-click the Run FlexEngine as Group Policy Extension policy setting. It is required to either enable this policy or configure a policy to run FlexEngine as a Logon script. We recommend enabling this policy rather than running FlexEngine as a Logon script. In the Group Policy Management Editor dialog box, navigate to User Configuration > Administrative Templates > VMware UEM > FlexEngine, and double-click the Profile archives policy setting. Provide the path to the profile archives share you created as part of the exercise Create and Configure the Profiles Share. Be sure to append %username%\Archives to the end of the path so that a unique subfolder can be created for each user. The personal user settings are read from this share at login or at application start and are written back at application exit or at logout. The policies circled in the following figure represent a minimum configuration for FlexEngine. In the Group Policy Management Editor dialog box, navigate to User Configuration > Administrative Templates > VMware UEM > FlexEngine, and double-click the Profile archives backups policy setting. Enable the policy. This policy is recommended but not required. Enter 5 for the number of backups. In the Group Policy Management Editor dialog box, navigate to User Configuration > Administrative Templates > VMware UEM > FlexEngine, and double-click the FlexEngine logging policy setting. Important: Setting the log level to Debug should only be used for evaluation or troubleshooting purposes. 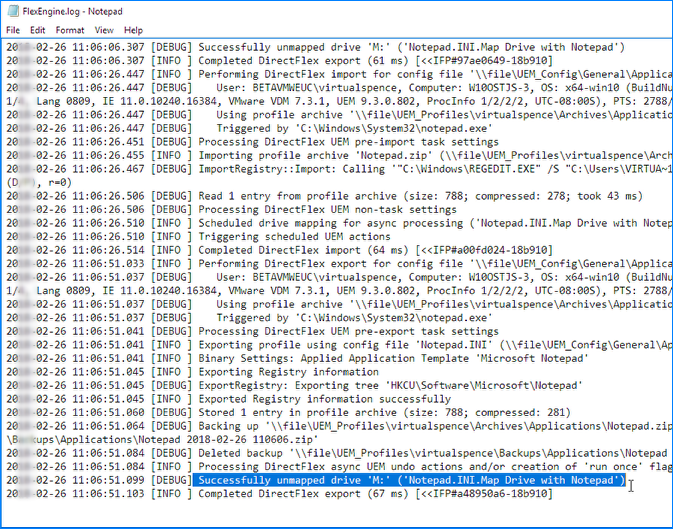 For production implementations of User Environment Manager, consider enabling debug logging for individual users as described in the VMware KB article Enabling debug logging for a single user in VMware User Environment Manager (2113514). The following figure shows the recommended FlexEngine policies to enable and configure for User Environment Manager. Navigate to User Configuration > Policies > Windows Settings > Scripts (Logon/Logoff). In the right pane, double-click Logoff to open the Logoff Properties window. Enter the path to the location where FlexEngine.exe is installed on the Windows virtual desktops. The default path is C:\Program Files\Immidio\Flex Profiles\FlexEngine.exe. Enter -s in the Script Parameters field. 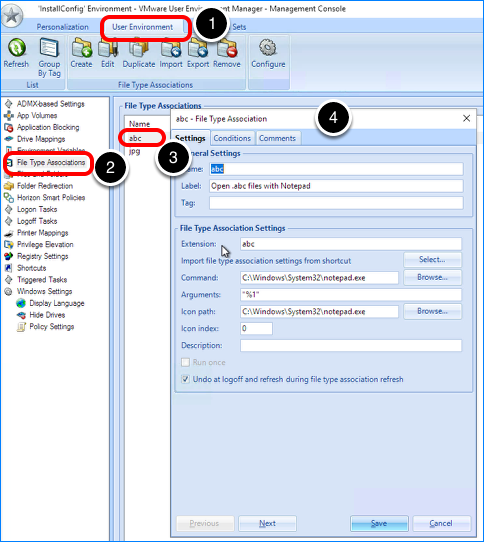 The -s flag tells FlexEngine to store the settings configured through the User Environment Manager Group Policy Object. The settings are stored in the Archives folder for the user on the profile archives share. The following ADMX video provides a detailed demonstration of the steps outlined in this section. If you need additional detail, you can find it here. This video is 1 minute. NoAD mode is a way to configure User Environment Manager without requiring Active Directory. For example, you can use NoAD mode if your environment has limited Active Directory access, and administrators are not permitted to set GPOs. NoAD mode is always recommended for cloud-based implementations. For more information, see Benefits of VMware Horizon Cloud on Microsoft Azure & VMware User Environment Manager. Another use case is when you are working with a proof-of-concept environment. You can implement User Environment Manager in NoAD mode quickly because there is no need to change a GPO, configure logon and logoff scripts, or wait for Active Directory replication. You configure User Environment Manager by creating an XML-based configuration file. This file contains all the same settings that you would otherwise configure using GPO settings. VMware provides an example file for this purpose. You can copy the file to the correct location on the configuration share and edit the file with a text editor to specify the settings you want to use. You install the User Environment Manager agent in NoAD mode on the virtual desktops or RDSH servers to be managed. This process involves using a command-line command that tells the agent the path to the XML-based NoAD configuration file. The agent can then read this configuration file to determine which User Environment Manager settings to apply. In the examples for the following exercises, we use a virtual desktop VM that is part of a VMware Horizon 7 setup, though this is not required. 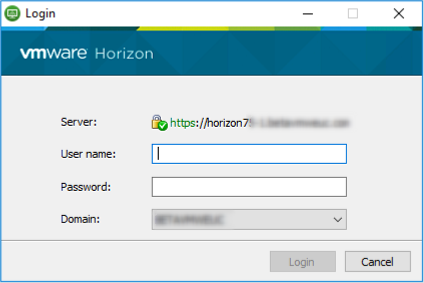 If you are using a Horizon 7 environment, you will need to have access to a desktop or RDSH server VM, and you will need VMware Horizon® Client™ for logging in to the VM after you install the User Environment Manager agent. Before you begin the exercises in this chapter, you must complete the Installation exercises. VMware provides a sample XML configuration file to simplify using NoAD mode. You can either copy this file from the User Environment Manager installation package you downloaded, or copy contents of the file from a topic in the product documentation. At a minimum, you must edit only a few required settings in the sample file. With the NoAD mode configuration file in the correct location on the configuration share, you can install the User Environment Manager agent on managed endpoints. As part of this agent installation, you specify the path to the NoAD configuration file you create in this exercise. Before you begin this exercise, you must have completed all the Installation exercises, and you must know the paths to the User Environment Manager configuration share and the profile archives share. 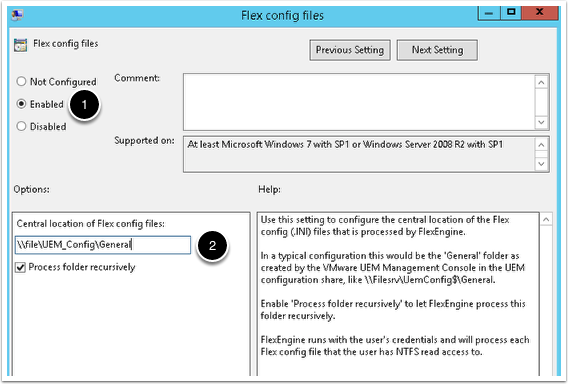 Navigate to the \\<configuration-share>\general\FlexRepository\ folder on the configuration share. Create a new folder called NoAD. You can copy and rename the NoAD Sample.xml file, located inside the NoAD Mode folder, from the installation package. If necessary, you can download this package from the VMware Download page. You can manually create an empty text file inside the NoAD folder on the configuration share, rename the file NoAD.xml, and copy and paste the contents from the Sample NoAD.xml topic. 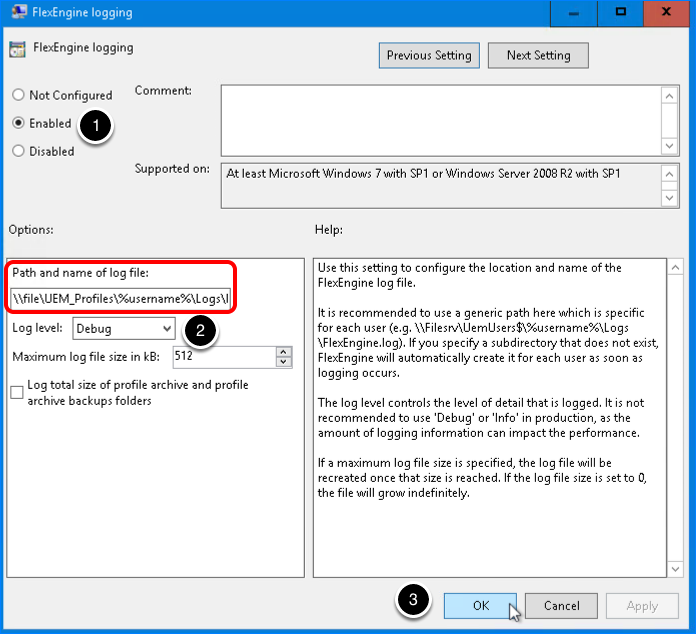 Path to the profile archives share (ProfileArchivePath) – Replace the text filesrv\UemUsers$ with the name of the file server and share folder you created as part of the exercise Create and Configure the Profiles Share. The %username%\Archives portion of the path allows a unique subfolder to be created for each user. The personal user settings are read from this share at login or at application start and are written back at application exit or at logout. Path to the log file (LogFileName) – Replace the text filesrv\UemUsers$ with the name of the file server and share folder you created as part of the exercise Create and Configure the Profiles Share. In the line LogLevel="1" change the 1 to 0, which changes the level of logging from Info to Debug. 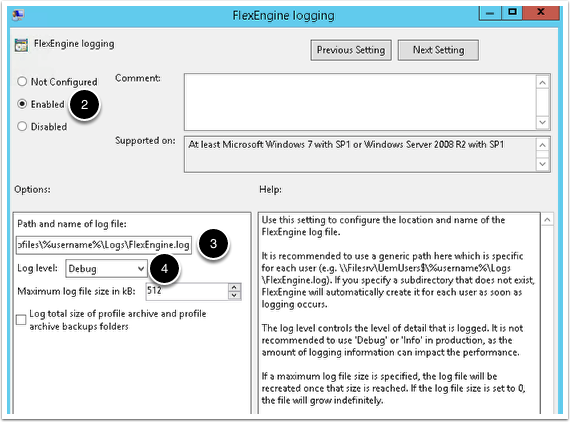 For a complete list of the various logging levels and their corresponding settings, see Configuring FlexEngine Logging Settings. Save and close the NoAD.xml file. Note: This exercise demonstrates using only a few of the many possible configuration settings. 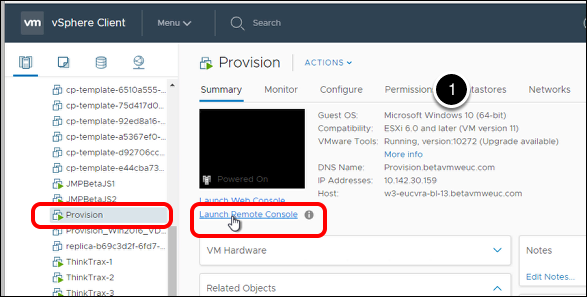 For information about all of the other settings, see Configuring User Environment Manager with NoAD Mode, and see the VMware KB article Configuring advanced UEM settings in NoAD mode (2148324). Rather than running the interactive VMware User Environment Manager Setup wizard, as you did in Install the User Environment Manager Agent (FlexEngine) on the Desktop or RDSH Server, for NoAD mode, you run the installer using a command-line command. You also specify command-line options that provide the path to the XML-based NoAD configuration file you created in Create the User Environment Manager NoAD Configuration File. The prerequisites for installing FlexEngine in NoAD mode are the same as for installing the agent without using NoAD mode. Windows OS – The machine must be running a supported Windows version. See Software Requirements. In addition, you must know the path to the NoAD.xml configuration file you created in the exercise Create the User Environment Manager NoAD Configuration File. Important: The VM you use for this exercise must not already have FlexEngine installed. If you plan to use the same VM that you used in the earlier exercise Install the User Environment Manager Agent (FlexEngine) on the Desktop or RDSH Server, you first must uninstall the agent before you re-install the agent in NoAD mode. For this example, we downloaded the installer to a template VM hosted on an ESXi server. 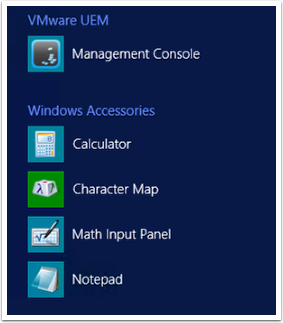 To connect to this VM, called Win10-template_JMP, you would select the VM in the inventory list and select Launch Remote Console. Log in to the virtual desktop or RDSH server VM, right-click the cmd application and select Run as administrator. Change directories to the directory where the msiexec.exe file is located. "\\file\software\infra\UEM\VMware User Environment Manager 9.3 x64.msi"
The NoAD.xml file you created in Create the User Environment Manager NoAD Configuration File resides in the subfolder FlexRepository\NoAD\ inside the General folder. In this example, <\\file-server>\<share> is the file share where the license file is located. You can place this command-line option after the /qn option. You can copy the complete syntax of the command from Install User Environment Manager in NoAD Mode. If you plan to use this VM as a master, or template, VM for creating a desktop pool or RDSH server farm, you can shut the VM down and take a VM snapshot. To verify that User Environment Manager is working correctly in NoAD mode, you must log in to the machine so that profile-specific files can be created on the file share. If you are using a Horizon 7 virtual desktop, use Horizon Client to log in to the desktop pool that contains the VM with NoAD enabled. If you are using an RDSH server, you must create an application or desktop pool and use Horizon Client to launch an application or session-based desktop. Navigate to the profile archives share and verify that a user-specific folder has been created. Verify that inside this folder, the Archives and Logs folders have been created. After login is complete, open the FlexEngine.log file in the Logs folder, and verify that you see the line Running from service (NoAD). 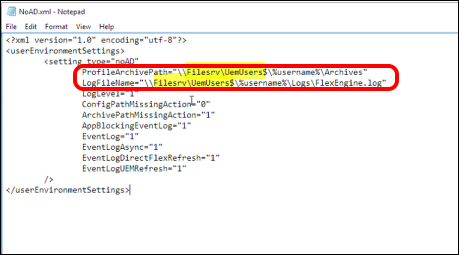 For the example in this exercise, the path to this folder is \\<file-share>\UEM_Profiles\<username>\Archives\Logs. Also look for DEBUG lines, which verify that the agent is running using the Debug level of logging, which you set when running the installer. The following NoAD video provides a detailed demonstration of the steps outlined in this exercise. If you need additional detail, you can find it here. If you already completed the NoAD Mode configuration, feel free to skip the video. This video is 4 minutes. By default, User Environment Manager does not manage any applications or environment settings after you install it. You must specify which applications and settings to manage. Although this approach takes a little more work up front, this solution prevents excessive profile growth and profile corruption, enables user settings to roam across Windows versions, and gives you granular control to manage as much or as little of the user experience as needed. To help with getting started, the Easy Start button instantly adds many common Windows applications, including several versions of Microsoft Office, to the whitelist of applications managed by User Environment Manager. Many Windows environment settings are also added by Easy Start. You can then easily select an application or Windows setting to review and change the default settings. Credentials for the virtual or physical machine where you installed and performed the initial configuration of the User Environment Manager Management Console, as described in Configure the User Environment Manager Management Console. (Recommended but not required) Microsoft Office installed on the virtual desktop or RDSH server that you want to manage. You will be prompted to select the version of Microsoft Office that is installed. 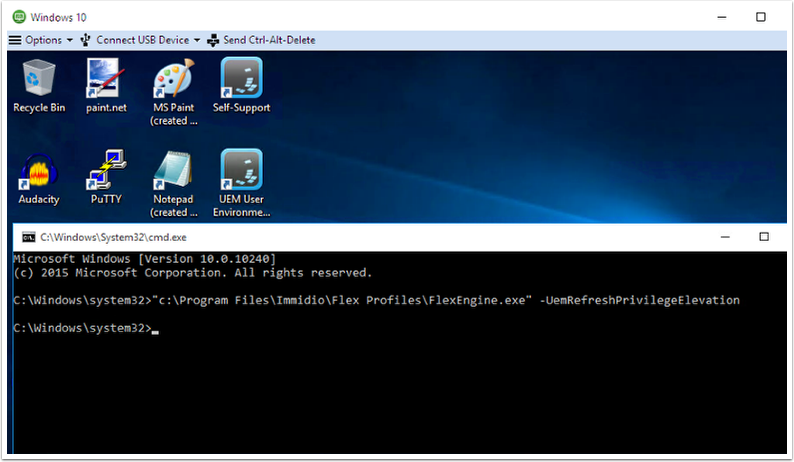 The path to the file is \\<file-share-server>\UEM_Config\Immidio Flex Profiles Configuration.xml. 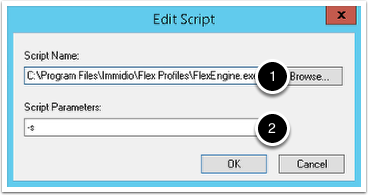 For the example in this exercise, the path is \\file\UEM_Config\Immidio Flex Profiles Configuration.xml. Note that the file contains no application-specific settings yet. 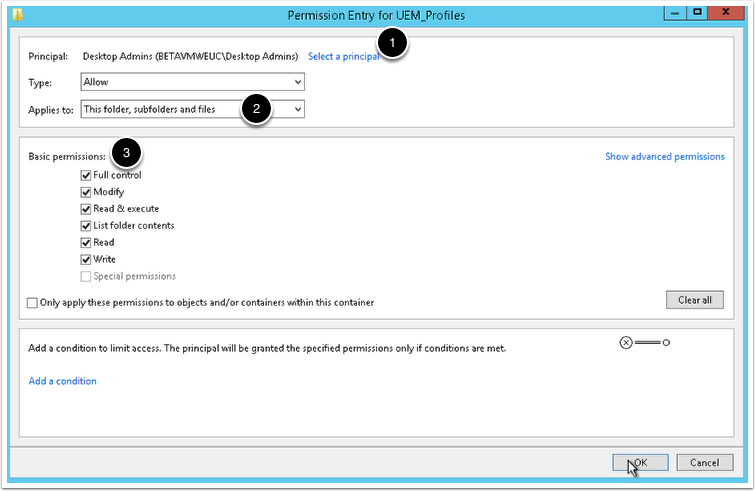 For the example in this exercise, the path is \\file\UEM_Config\General. Note that the folder is empty. Application-specific files are created in this folder when you configure User Environment Manager to manage an application. On the physical or virtual machine where the Management Console is installed, from the Start screen, select the Management Console shortcut in the VMware UEM folder. On the Personalization tab, note that in the left pane, no applications are listed under General. At this point, User Environment Manager is not managing any applications or Windows settings. Clicking this button allows User Environment Manager to manage many common Windows applications. Select the version or versions that are installed on the virtual desktop or RDSH server that you want to manage. Select OK in the confirmation dialog box that appears. 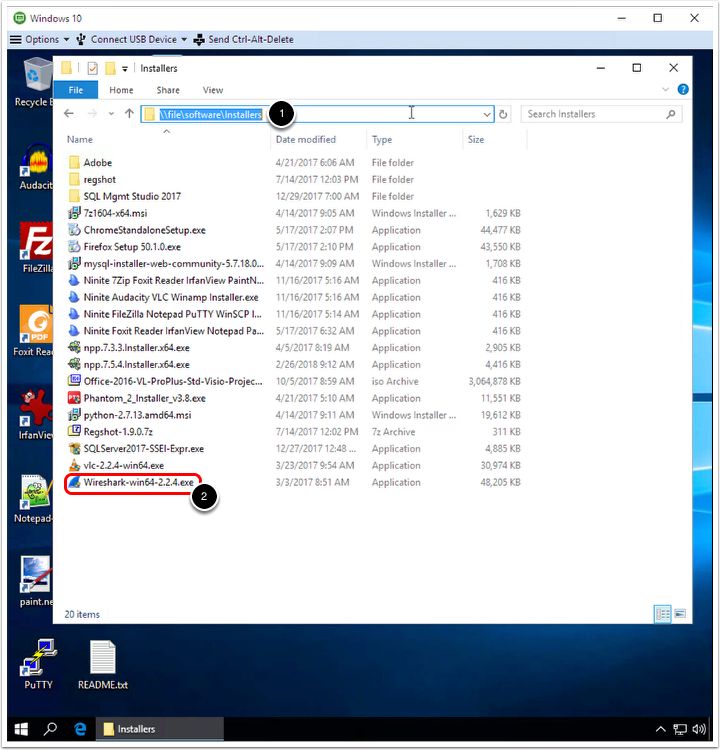 In the left pane, under General, you see a list of commonly installed Windows applications. These applications will now be managed with User Environment Manager. By default, when users log in and change application settings for these applications, their personalizations will be saved when they close the application. For example, if the user logs in to an instant-clone desktop and changes application settings, when the user logs out of the instant-clone desktop, the VM is destroyed. When the user logs in to a new instant-clone desktop and starts the application, the user will see that the settings were saved. The user has the experience of persistence even though the user logs in to a different instant-clone VM. These applications and Windows settings are now managed by User Environment Manager. You can examine the default settings and make any desired changes. Application icon files – Files with the .ico extension. 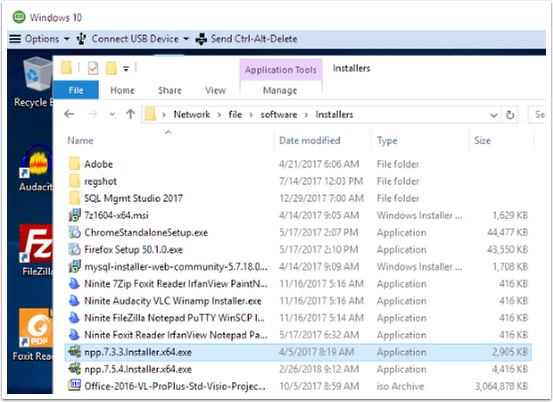 Application configuration files – Files with the .ini extension. Flag files – Files with the .INI.flag extension, which are for configuring the application to use the DirectFlex feature. With DirectFlex enabled, the User Environment Manager profile archives settings are imported and read when the user starts the application, rather than when the user logs in to the machine. Application settings are saved (exported) when the user quits the application, rather than when the user logs out of the machine. The Applications folder contains settings for the common applications included with Easy Start. 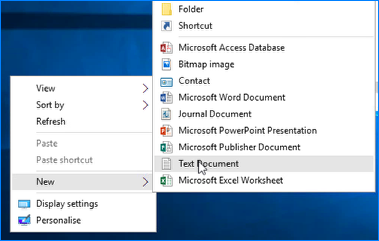 If you also selected to enable personalization for a Microsoft Office version, a folder for that version of Office also appears in the General folder. A Windows Settings folder is also created in the General folder. Flag files are almost never used for these settings because the DirectFlex feature applies only to application settings. Except for things like integrated IE or Edge browser cache settings, Windows settings are usually imported and exported at OS login and OS logout, respectively. The following Easy Start video provides a detailed demonstration of the steps outlined in this exercise. If you need additional detail, you can find it here. If you already completed the Easy Start configuration, feel free to skip the video. This video is 2 minutes. With the application personalization feature, end users can roam between disparate devices while preserving custom application settings and Windows personalization settings. When a user logs in to a virtual desktop or application, User Environment Manager reads the profile archive file for that user's profile and can, for example, display the desktop background or application settings that the user saved during the last session. In this exercise, you will log in to a physical or virtual machine as an end user, open an application, change some application settings, log out, and then log in again and verify that the settings have been persisted across sessions. You can even log in from different devices if you like. In the example for this exercise, we use a virtual desktop VM that is part of a Horizon 7 setup, though this is not required. You can use whatever physical or virtual machine you used to install the agent, as described in Install the User Environment Manager Agent (FlexEngine) on the Desktop or RDSH Server or Install the User Environment Manager Agent in NoAD Mode. If you are using a Horizon 7 environment, you will need to have access to the virtual desktop pool that has the User Environment Manager agent installed, and you will need Horizon Client or the web-based HTML Access client for logging in to the VM. Before you begin this exercise, you also must complete the Enable the Easy Start Feature exercise, which includes enabling one or more of the Microsoft Office application templates. 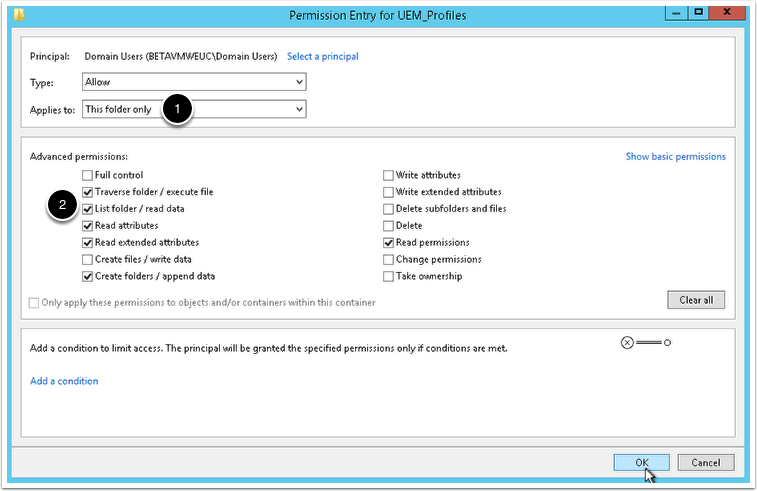 For the example in this exercise, the path is \\file\UEM_Profiles. Note that the folder is empty. User-specific folders are created in this folder after the end user logs in to the machine for the first time. Important: Keep this window open, and size the window so that you can see it alongside the window you will use in the next step to open the virtual desktop. For the example in this exercise, we are using a Horizon 7 instant-clone desktop, and we access it through the VMware Workspace™ ONE™ catalog. As soon as the login process begins, a new folder is created on the profile archive share. The folder is named according to the user name of the user logging in. At this point, the agent on the virtual desktop is importing the User Environment Manager settings from the configuration files in the General folder on the configuration share. 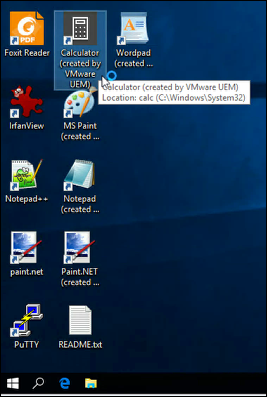 After login is complete and the desktop appears, note that several desktop shortcuts have been created by the Easy Start feature, including Calculator (Created by VMware UEM). Other examples include MS Paint, Notepad, and Wordpad. For a list of application shortcuts created by the Easy Start feature, you can go to the User Environment tab in the Management Console and select Shortcuts in the left pane, as shown in the following figure. From the Start screen of the virtual desktop, click the Start button, select All Apps, and click to expand Microsoft Office 2016 (created by VMware UEM). Note: If, when completing the Easy Start exercise, you selected a different Microsoft Office version, navigate to that version. If PowerPoint prompts you to accept the license agreement, for the update option, select Ask me later, and click Accept for the license agreement. 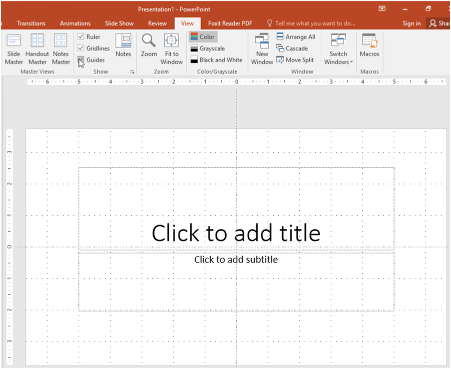 In the list of templates, select Blank Presentation. Note: At this point, if you look in the profile archive Archives folder for the user, you see only an Applications folder and a Logs folder. No folders for Microsoft Office applications appear yet because this is the first time the user has started an Office application. 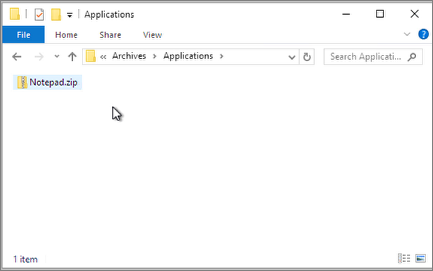 In the Applications folder, the only application file you can see is for Notepad because Notepad is used to import settings. Select the Ruler, Guidelines, and Guides check boxes. Log out of the virtual desktop OS. 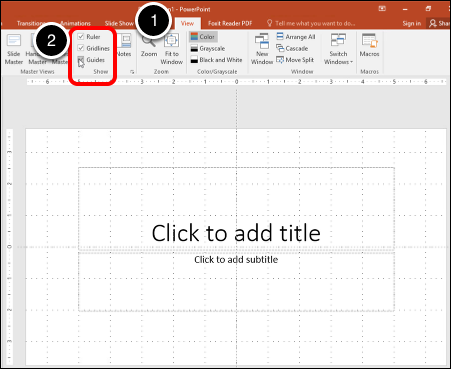 After you log out of the VM, all the default settings for Microsoft Office applications, and the settings you changed for PowerPoint, are saved to the profile archives share. Navigate to the Archives folder for the user and verify that a folder for Microsoft Office has been created. 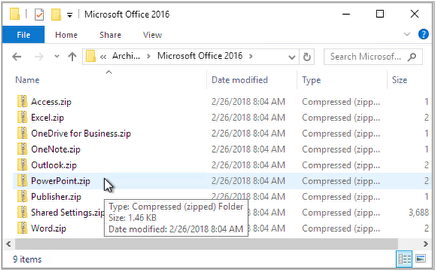 For the example in this exercise, the path to the Archives folder is \\<file-share>\UEM_Profiles\<username>\Archives\, and a Microsoft Office 2016 folder is created. 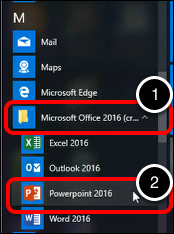 Open the Microsoft Office 2016 folder, and scroll through the list of files. The PowerPoint.zip file contains settings used when you closed the application, including the settings you changed on the View tab. The other ZIP files in this folder contain default settings for the other Microsoft Office applications. Log in to the virtual desktop as the same end user. 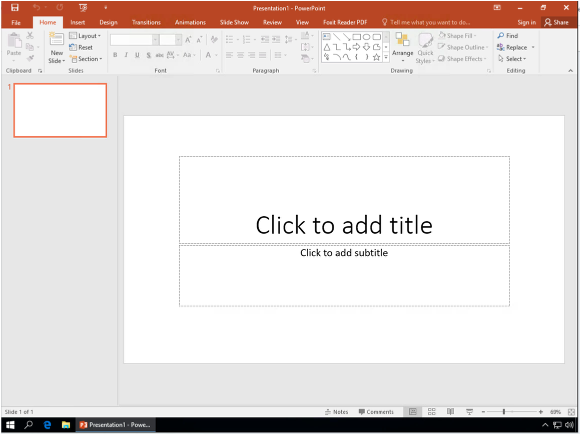 Start PowerPoint, and select Blank Presentation again. Note that the ruler, gridlines, and guides are shown rather than hidden. If you are using a Horizon 7 instant-clone desktop, the VM that you first logged in to was destroyed, and this new desktop still displays the PowerPoint settings you chose using the previous VM. If you are using a full-clone desktop, you might be able to replicate this experience by reverting the VM back to a snapshot taken before you ever logged in for the first time. When you log in after reverting, you will still see the personalized PowerPoint settings. If you are using a physical PC, which would ordinarily persist the settings whether or not you are using User Environment Manager, you can test this feature by removing the user profile before you log in again. Alternatively, you can log in to a different physical PC. This exercise demonstrates how User Environment Manger, when used in conjunction with stateless virtual desktops, can give the experience of persistent, stateful desktops. The following App Personalization video provides a detailed demonstration of the steps outlined in this exercise. If you need additional detail, you can find it here. If you already completed the Application Personalization exercise, feel free to skip the video. This video is 2 minutes. In this exercise, you will install the Application Profiler tool, which is included in the User Environment Manager installation package. 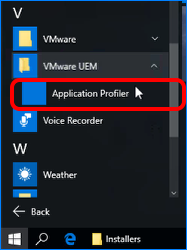 After Application Profiler is installed in a provisioning VM, you can run the tool to open the application you want to profile, change some settings, and then create a template you can use to manage the application for your end users. Provisioning machine – The machine that you use to profile the application must use the same Windows OS version and similar patch version as the machine that your end users will use. For supported Windows versions, see Application Profiler System Requirements. 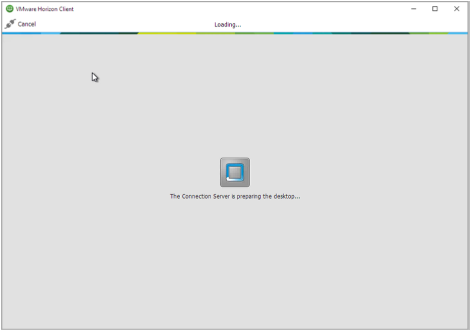 Note: The provisioning machine must not have the User Environment Manager agent installed on it. VMware recommends that the provisioning machine not have any additional applications installed aside from those included with the OS and VMware Tools, if you are using a VM. User account – When you log in to the provisioning machine to run the Application Profiler installer, the account you use must have administrative privileges. Installer – The Application Profiler installer is included in the User Environment Manager installation package, in the Optional Components folder. If necessary, you can download the package from the Product Evaluation Center or the VMware Downloads page. The installer is an architecture-specific (x86 or x64) MSI file. Application to profile – For the example used in this exercise, you can download the Notepad++ application. The application that you profile must be the same version that is installed in the machine that your end users will use. Note: Application Profiler can profile applications that are installed natively in virtual desktops or RDSH servers, as well as applications that are delivered by VMware App Volumes AppStacks. For this example, we downloaded the installer to a provisioning VM hosted on an ESXi server. To connect to this VM, called Provision, you would select the VM in the inventory list and select Launch Remote Console. If you are performing this exercise in your own lab, you can download and extract the Application Profiler installer file, which is located in the Optional Components folder of the installation package, and copy the file to the system where it will run or to a location accessible to the system. Log in to the provisioning machine, and browse to the location of the Application Profiler installer. Double-click the installer file to start the wizard, and follow the prompts. You can accept all the defaults. Tip: (Optional) After installation is complete, shut down the machine and take a VM snapshot. With a VM snapshot of the machine, you can easily revert the machine to its pristine condition after you finish profiling an application. You can then use the machine to profile a different application, and so on. On the provisioning machine, browse to the location of the installer for the application you want to profile. For the example in this exercise, we used the Notepad++ application, but you can use any application that your end users will use. Be sure to use the same version that your end users have. De-select the Auto-Updater check box. Select the Localization check box. Select the Create Shortcut on Desktop check box. Important: VMware recommends that, if possible, you install the application so that automatic updating is disabled, especially if you use instant clones. For the purposes of this exercise, enable localization packs, as shown in the following figure. In this exercise, we will test profile settings by changing the language used in the UI. 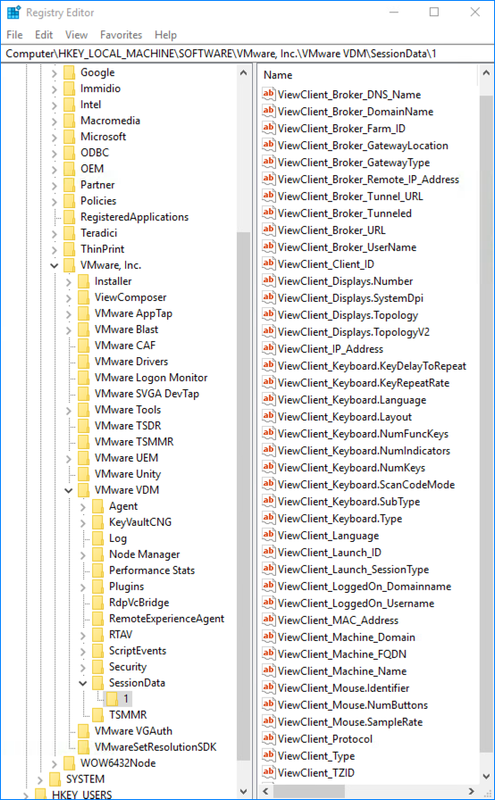 From the All Programs list on the provisioning machine, Application Profiler is located in the VMware UEM folder. Browse to and select the application. After you click OK, Application Profiler opens the application to be profiled and begins monitoring the changes you make and where those changes are saved in the Windows registry and file system. For example, the VLC Player application saves some changes to .ini files and some to the Windows registry. 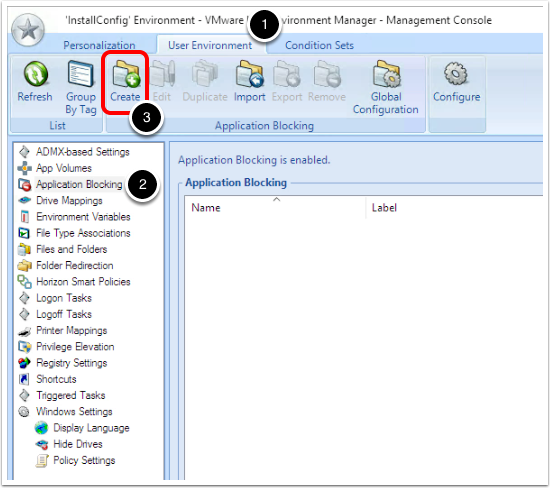 For more information, see Profiling Applications with VMware User Environment Manager, Part 2: Applying and Troubleshooting Predefined Settings. From the menu bar, select Settings > Preferences. From the Toolbar list, select Big icons. De-select the Show status bar check box. Application Profiler saves the changes you made, and prompts you to confirm that profiling is finished, as shown in the following figure. Application Profiler also displays the location in the file system where the Notepad++ configuration changes where made. In this case, settings were written to a Notepad++ subfolder of the AppData folder. Open Windows Explorer and type %AppData%\Notepad++ into the text box for navigating the path. The %AppData% variable resolves to the correct location on the machine, and the contents of the Notepad++ folder are displayed, which include a configuration file. Click the Save button, and select Save Config File. 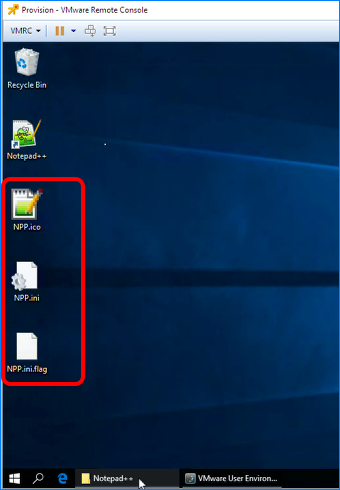 When prompted, provide a file name, such as NPP, and save the Application Profiler configuration files to the desktop. In this exercise, you are creating a configuration file to enable application personalization by the end user, so that when an end user changes a Notepad++ preference, the user's preference will be saved across sessions and VMs. Because you select Save Config File, rather than Save Config File with Predefined Settings, the preference settings you changed in this exercise will not be presented to end users. For more information, see Saving a Flex Configuration File With Predefined Settings. 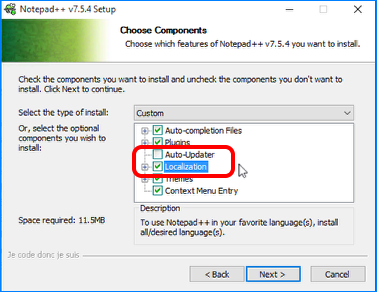 You changed preference settings in Notepad++ only so that Application Profiler could monitor and determine the path to the application configuration file. NPP.ico – The icon file. NPP.ini – The application configuration file. 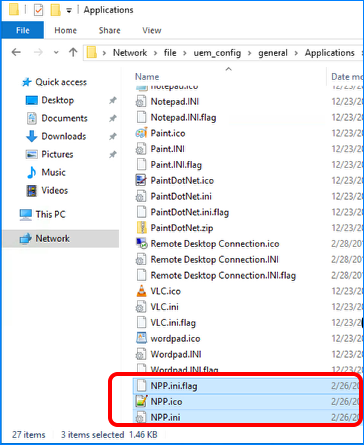 NPP.ini.flag – The flag file, which tells User Environment Manager to import settings when the application starts and export the user settings when the application closes. For the example in this exercise, the folder is located in \\<file-server>\UEM_Config\General\Applications. Note: After you paste the files in this location, if you close the User Environment Manager Management Console and start it again, you see Notepad++ added to the list of applications being managed, as shown in the following figure. Also note that the NPP.ini.flag file enables DirectFlex for this application, and the path to the executable is recorded. 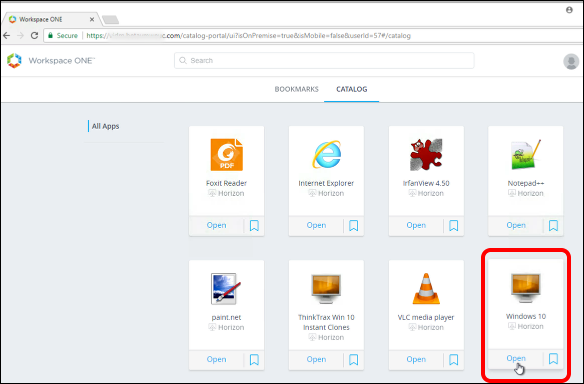 For the example in this exercise, we are using a Horizon 7 instant-clone desktop, and we access it through the VMware Workspace ONE catalog. After login is complete, start the application, and select Settings > Preferences, and select Big icons. From the Localization list, select Deutsch and save the settings. 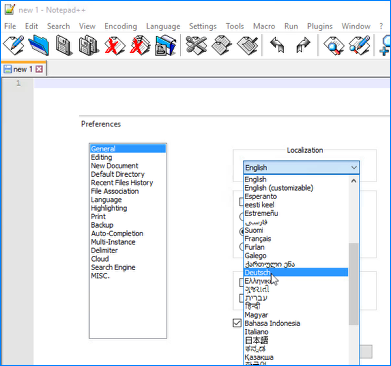 In Notepad++ the toolbar icons are now large and the menu names are displayed in German, as shown in the following figure. Navigate to the profile archive Applications folder for the user, and note that a new NPP.zip file has been created. After you log out of the virtual desktop and log in again as the same user, when you start Notepad++, you see that your settings have been preserved. If you are using a Horizon 7 instant-clone desktop, the VM that you first logged in to was destroyed, and this new desktop still displays the Notepad++ settings you chose using the previous VM. If you are using a full-clone desktop, you might be able to replicate this experience by reverting the VM back to a snapshot taken before you ever logged in for the first time. When you log in after reverting, you will still see the personalized Notepad++ settings. Go to the VMware User Environment Manager Community Forum, which contains many more templates created with Application Profiler. 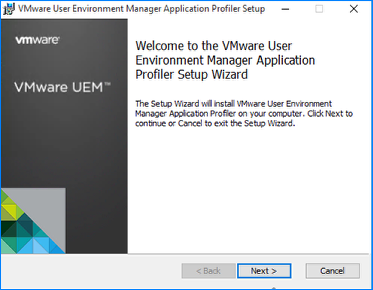 See the VMware User Environment Manager Application Profiler Administration Guide and the blog series that begins with Profiling Applications with VMware User Environment Manager, Part 1: Introduction to Application Profiler. The following App Profiler video provides a detailed demonstration of the steps outlined in this exercise. If you need additional detail, you can find it here. If you already completed the Application Profiler exercise, feel free to skip the video. This video is 6 minutes. User environment settings include many different kinds of settings, some of which can be application-specific, and some can pertain to the user's whole virtual desktop environment. These are imported when the user logs in to the OS. For example, you can map a drive to a virtual desktop either when a user logs in to the OS or when a user starts a specific application. Besides configuring environment settings, you can specify the conditions under which the settings are applied, and you can specify which tasks might trigger a setting to be used. To configure environment settings for a user's whole virtual desktop environment, you can click the User Environment tab at the top of the Management Console, as shown in the following figure. 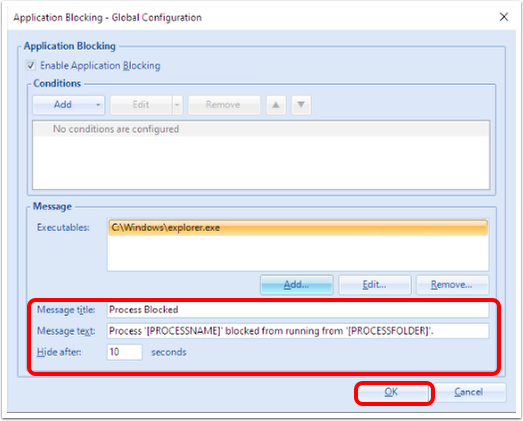 Application Blocking – An advanced feature that is discussed in the later exercise Configure Application Blocking. 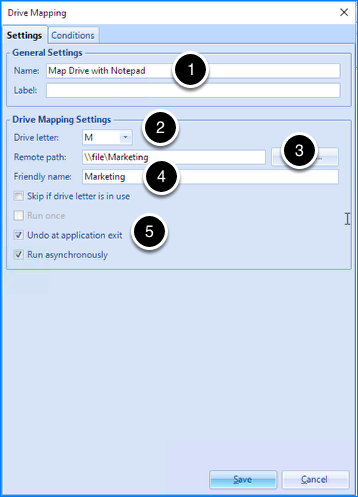 Drive Mappings – A feature that is explored in this exercise, but is applied to a specific application. File Type Associations – A feature that is explored in this exercise, wherein you configure which application is used to open files with a specific file extension. Horizon Smart Policies – A feature that integrates with Horizon 7, in which a number of key Horizon 7 features can be dynamically enabled or disabled based not only on who the user is, but on the many different variables available through Horizon 7: client device, IP address, pool name, and so on. For more information, see the chapter Horizon Smart Policies. 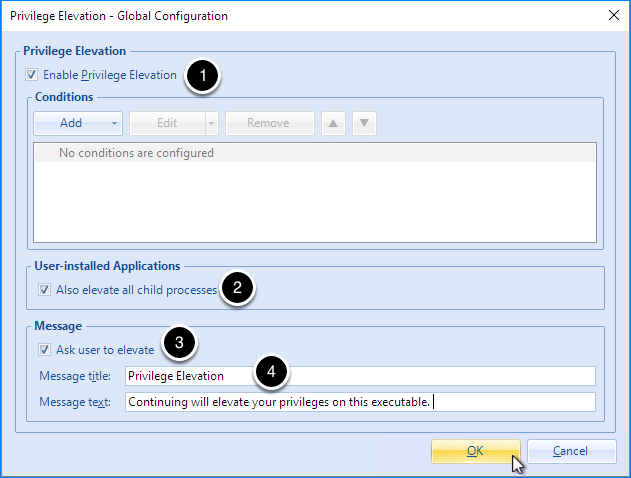 Privilege Elevation – An advanced feature that is discussed in the later exercise Configure Privilege Elevation for Installing an Application. Shortcuts – A feature that lets you configure whether to use a desktop shortcut or a Program folders shortcut (or both), the shortcut name, the shortcut icon, and more. An introduction to this feature is provided in Test Application Personalization. Providing exercises for all the different types of user environment settings is beyond the scope of this quick-start tutorial, but you can easily get an introduction by selecting items in the list and reviewing the user friendly control labels for each one in the Management Console. Also see Configuring User Environment Settings. For information about App Volumes settings, see VMware User Environment Manager with VMware App Volumes. In addition to configuring settings for the whole desktop environment, you can configure settings based on which applications a user launches. 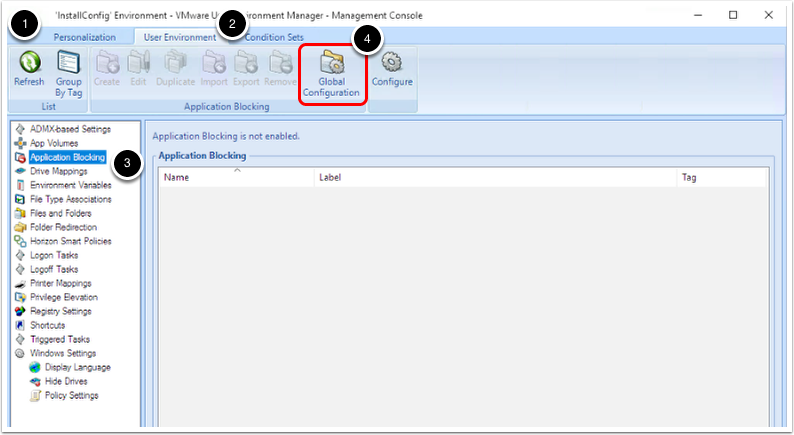 To configure environment settings for a specific application, you can select the application in the list, and click the corresponding User Environment tab, as shown in the following figure. You will use both types of User Environment tabs in this exercise. Notepad application listed as a managed application in the Management Console. This application is listed after you complete the exercise Enable the Easy Start Feature. An Active Directory group containing an end-user account that you can use to log in to a virtual desktop. As part of this exercise, you will remove this user account from the AD group to test a conditional setting. End-user credentials for that end-user account. Inside the Marketing folder are the subfolders Docs, PPT Templates, and Reports. Note: Throughout this exercise you will frequently change between your Windows end-point device where the User Environment Manager Agent is installed, and the physical or virtual machine where the Management Console is installed. It is recommended that you simply minimize the unused screen to streamline the testing process. In the User Environment Manager Management Console, select Notepad in the left pane. 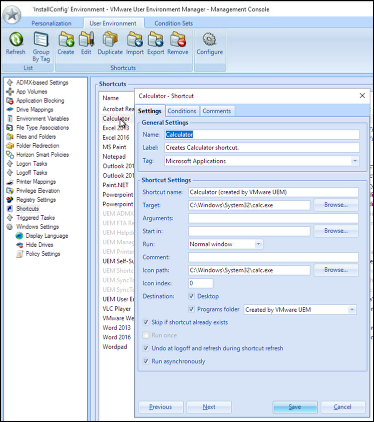 Select the DirectFlex tab, and select the Enable DirectFlex for this config file check box. Enabling DirectFlex is required for configuring application-specific user environment settings. Select the User Environment tab. Select Drive Mapping from the list. 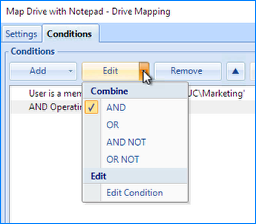 In the Name text box, enter Map Drive with Notepad. This is the name of the setting as it appears in the User Environment Manager Management Console. For Drive letter, select a letter that is not already in use. For the example in this exercise, M is used. For Remote path, enter the path to the share that you want to map to a drive letter. For the example in this exercise, \\<file-server>\Marketing is used. For Friendly name, enter the name that you want end users to see in Windows Explorer next to the drive letter. Select the Undo at application exit check box. This setting unmaps the drive when the user closes the application. The Run asynchronously check box is selected by default. This setting helps the drive-mapping process to complete quickly. 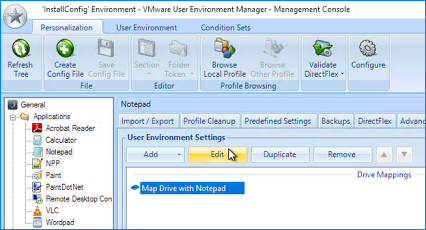 After you save the settings in the Drive Mapping dialog box, the new configuration is listed on the User Environment tab for Notepad, using the name you specified in the Name text box. Select Save Configuration in the main toolbar. Log in to the virtual desktop as an end user. 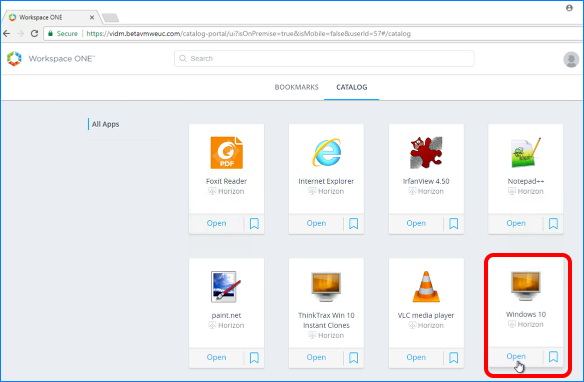 For the example in this exercise, we are using a Horizon 7 instant-clone desktop, and we access it through the VMware Workspace ONE catalog. 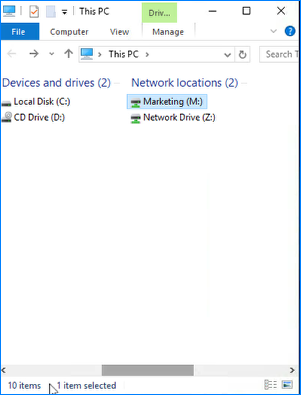 Open Windows Explorer to view the drives mapped to the virtual desktop. Note that the drive you configured is not mapped yet because, at this point, you have logged in but not started the Notepad application. 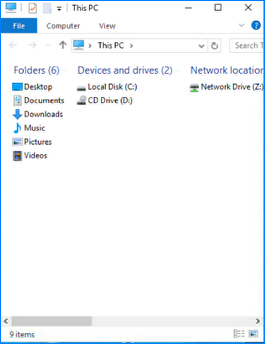 Open Windows Explorer to view the drives mapped to the virtual desktop. Note that the drive you configured is now mapped. Note: If you do not see the mapped drive immediately, wait a few seconds and refresh the window. Open Windows Explorer again and note that the drive has been unmapped. Log out of the virtual desktop. Open the FlexEngine.log file in the Logs folder of the profile archives folder for the user, and verify that you see the line Successfully unmapped drive 'M:' ('Notepad.INI.Map Drive with Notepad'). 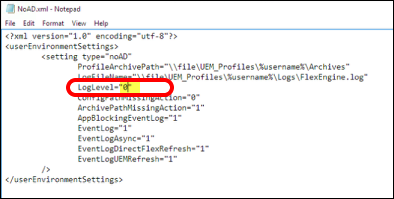 For the example in this exercise, the path to this folder is \\<file-share>\UEM_Profiles\<username>\Archives\Logs. You can also search the file for all instances of the word "map" to find other entries for mapping events. On the Personalization tab of the Management Console, select the Map Drive with Notepad setting, and select Edit. On the Conditions tab, select the Add button, and select Group Membership. In the Group Membership dialog box, click Browse to search for and select the group. This is the AD group mentioned in Prerequisites that contains an end-user account that you can use to log in to a virtual desktop. In this exercise, you will remove this user account from the AD group to test the conditional setting. On the Conditions tab, select the Add button, and select Windows Version. Select Windows 10, or whatever version of Windows is installed in the virtual desktop. After you click Save, the condition is added to the Conditions tab, and is combined with the first condition, as shown in the following figure. 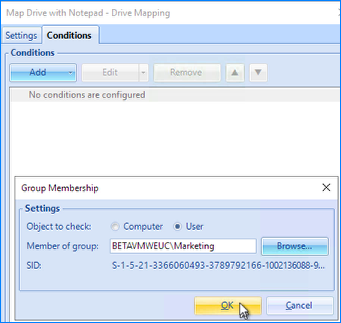 At this point in the exercise, the conditions for mapping a drive when the user starts the Notepad application are as follows: The user must be a member of a particular AD group (the Marketing group) and that the user must be logged in to a Windows 10 desktop. Note: By default the AND operator is used when you add a condition, but you can select the condition and select Edit to change the default operator, as shown in the following figure. For this exercise, we use AND. In Active Directory Users and Groups, remove the end user from the AD group that you set up as part of the Prerequisites. For the example in this exercise, the group had only one member, which we removed. Log in to the virtual desktop using the end-user account that you just deleted from the AD group. Open Windows Explorer and note that the drive is not mapped to the virtual desktop. The drive is not mapped because the user does not meet the condition of belonging to the AD group. 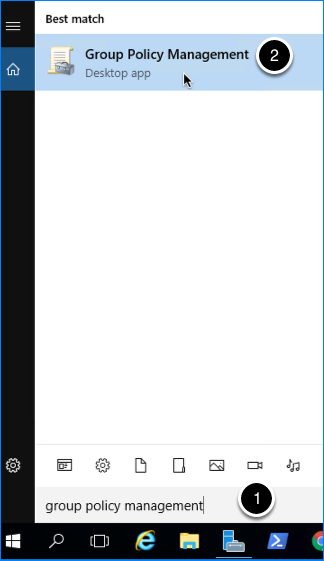 Close Notepad and log out of the virtual desktop. Open the FlexEngine.log file in the Logs folder of the profile archives folder for the user, and verify that you see the line Conditons: Check for user membership of group '<group-name>' = false. Note: You must have the log level set to DEBUG to see this entry. The entry that follows, however, is visible at the INFO level: Skipping drive mapping due to conditions. At this point, you could add the user back to the AD group and then log in to the desktop again to verify that the drive will now be mapped when you start Notepad. In the Management Console, select the User Environment tab. In the list, select File Type Associations. In the right pane, double-click abc. Review the Settings tab. With this setting, all files in the virtual desktop file system that use the file extension .abc are opened with the Notepad application. Select Cancel. You do not need to save the settings because these are the default settings included with Easy Start. Log in to the virtual desktop as an end user, and on the desktop, create a new text file with the .abc file extension. Double-click the file, and note that the default application used to open the file is Notepad. For the steps in this exercise, after you created a new setting or changed a setting, you had to log in to the virtual desktop again to verify that the new setting was properly applied. However, you can use FlexEngine command-line commands on the virtual desktop to refresh environment settings so that you do not need to log out and log back in. For example, when you are logged in to a virtual desktop as an end user, you can try changing the file type association for files with the .abc extension so that Microsoft Word opens them rather than Notepad. Or you could change which application shortcuts are created for one of the default applications, such as Notepad or Calculator. After you make the change in the Management Console and save the configuration, on the virtual desktop, you can run the command to refresh the shortcuts and file type associations. For the example in this exercise, use the following command. Different command-line options are provided for refreshing different types of settings. For more information, see FlexEngine Command-Line Arguments and Additional FlexEngine Operations. Besides running these commands on the virtual desktop, you can use these commands in scripts and logon tasks. The following User Environment Settings video provides a detailed demonstration of the steps outlined in this exercise. If you need additional detail, you can find it here. If you already completed the User Environment Settings exercise, feel free to skip the video. This video is 5 minutes. This feature, which is also called application authorization, enables administrators to build blacklists and whitelists of applications to control application and license sprawl. You can also create condition settings to control the circumstances under which an application can be used. For example, you can create a condition that allows a user access to company-specific applications only when the user is on the internal corporate network. 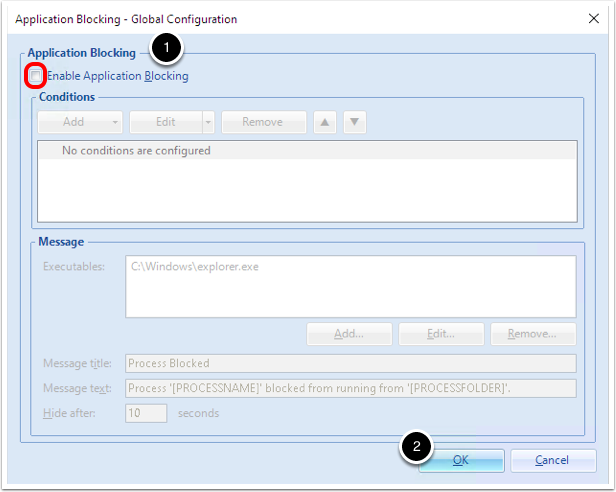 The following Configure Application Blocking section provides a brief overview of the application-blocking feature. For the purposes of this Quick-Start Tutorial, we recommend that you limit this feature to endpoint devices used for testing purposes. After you are comfortable with the way the feature works, and have the appropriate application-blocking rules defined, you can expand to using devices in your production environment. End-user credentials for the virtual or physical endpoint machine where you installed the User Environment Manager Agent, as described in Install the User Environment Manager Agent (FlexEngine) on the Desktop or RDSH Server. To complete all exercises, we recommend creating the following file structure on a file-share server. Copy Putty.exe to the software folder. 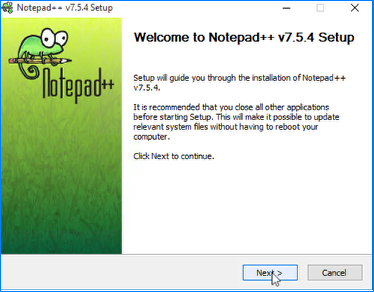 Copy Notepad++ to the installers folder. The Domain Users group, or whichever group you selected in Profile Archives Share Prerequisites, must have read and execute permissions to this file share. Note: Throughout this exercise you will frequently change between your Windows end-point device, where the User Environment Manager agent (FlexEngine) is installed, and the physical or virtual machine where the Management Console is installed. It is recommended that you simply minimize the unused screen to streamline the testing process. Log in to your Windows end-point device where the User Environment Manager agent is installed. 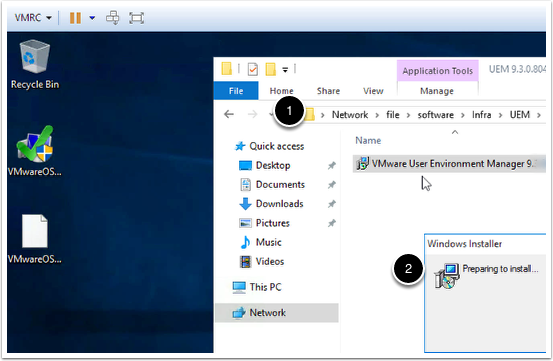 For the example in this exercise, we used a Windows 10, instant-clone VM, accessed through the VMware Horizon Client. From the Windows endpoint, browse to the file share and run Putty.exe. Select Cancel to close Putty. Remain logged in to the Windows endpoint device, but minimize the window before continuing to the next step. 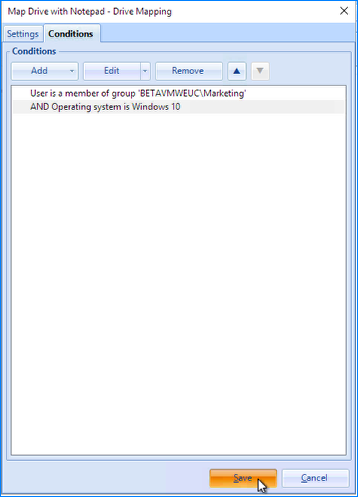 On the physical or virtual machine where the Management Console is installed, open the Management Console. 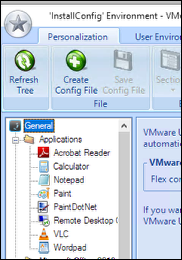 From the Start screen, select the Management Console shortcut in the VMware UEM folder. Browse to or enter the path to explorer.exe. Windows Explorer is considered a parent application, which means it is used to start other applications. The Message title, Message text, and Hide after text boxes are automatically populated. 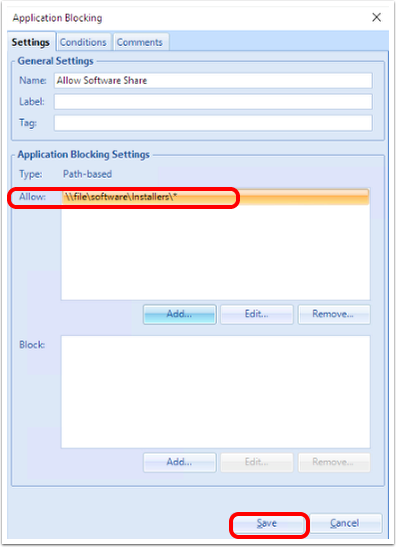 These fields define the notification that the end-user receives when the user attempts to start an application that is blocked by User Environment Manager. Although this notification is not required, we recommend that you leave this default configuration in place while testing the application-blocking feature. Review the disclaimer and select OK to continue. Application blocking is now enabled. If you use Windows Explorer to start an application whose executable file does not reside in C:\Program Files or C:\Program Files (x86), you will see the notification you configured in the previous step, and the application will not start. Maximize the virtual desktop window or reconnect to your Windows endpoint device. 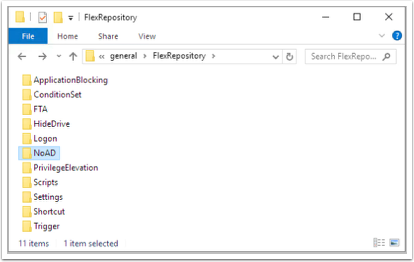 Open a command-prompt window and run the following command to force FlexEngine to check for updated application-blocking policies. 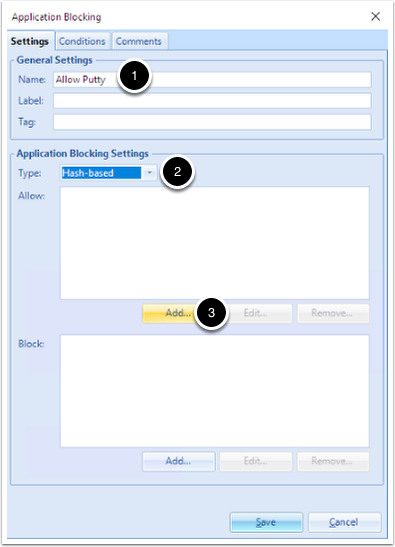 Application-blocking policy settings are read when a user logs in to Windows or when a triggered task occurs to refresh the policy settings. You can manually refresh the application-blocking policy settings on an endpoint device by running FlexEngine.exe at the command line with the appropriate argument. 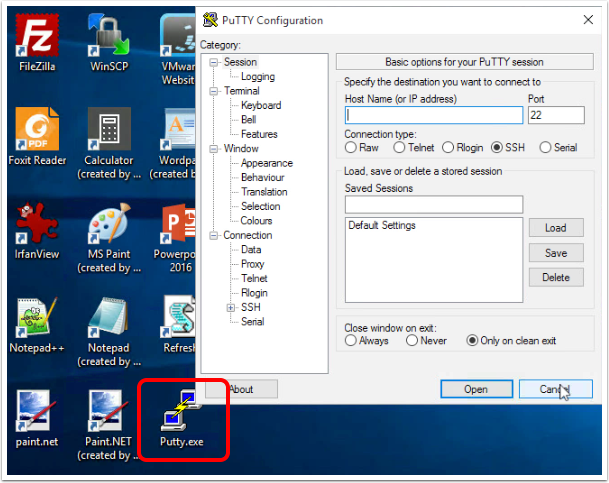 From the Windows endpoint, browse to the file share and double-click the Putty.exe file. 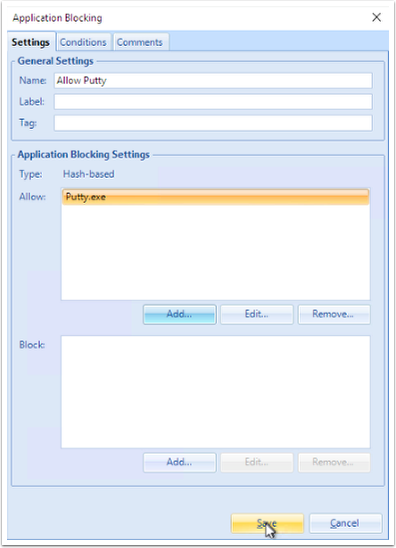 This time, Putty is blocked by User Environment Manager. If the default settings were chosen when you enabled application blocking, a notification is displayed for ten seconds. Copy Putty.exe from the file share to the virtual desktop. 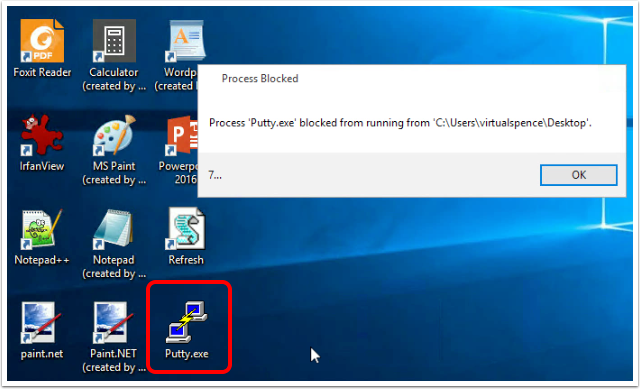 Double-click Putty.exe and notice that again it is blocked from running. Copy Putty.exe to C:\Program Files. Note: You may need to elevate permissions to copy the executable to this location. Double-click Putty.exe and notice the executable runs normally. This is because C:\Program Files is one of the default whitelisted folders for application blocking. Remain logged in to the Windows endpoint, but minimize the window before continuing to the next step. 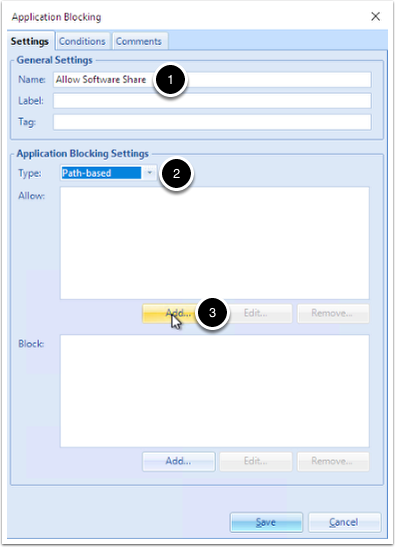 Select Create to create a new Allow rule for application blocking. 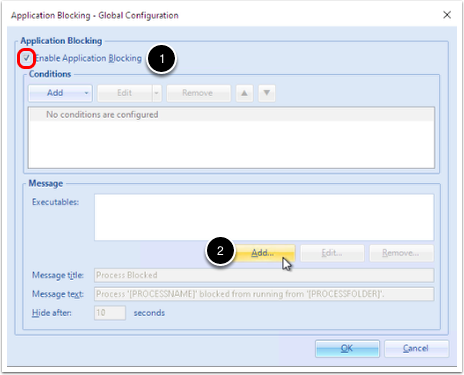 User Environment Manager provides several types of application-blocking rules. After you select the rule type, you can create settings to allow or block applications. In this exercise, you will create a hash-based rule and a path-based rule. The following section summarizes the rule types and the steps for creating application rules. 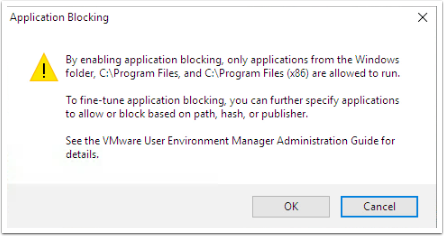 In the Application Blocking dialog box that appeared after you completed the previous step, enter a name for this application-blocking rule. Select Hash-based from the Type drop-down list. In the Allow section, select Add to browse to an executable. Browse to the file share where Putty.exe is stored and select Putty.exe. Note that a hash of the executable is made. Select Save to commit the new application-blocking rule. Verify that Putty.exe runs from the Desktop. Verify that Putty.exe runs from the file share. 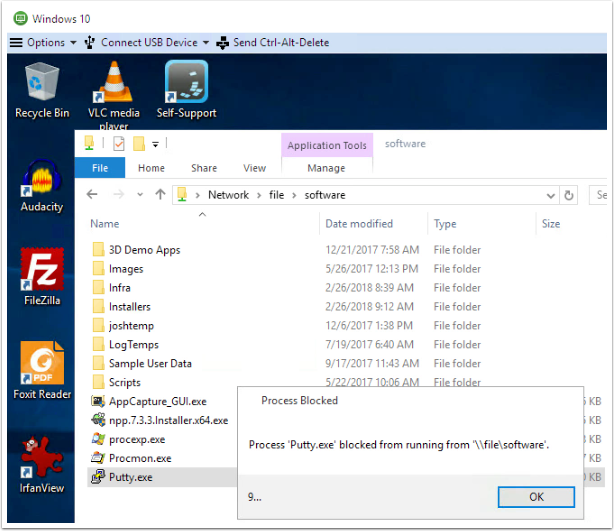 With the application-blocking Allow rule in place, Putty.exe can now run from any location. Double-click myapp.exe and notice the executable still runs. One of the advantages of hash-based application-blocking rules is that they work even if the end user renames the executable. Enterprises often need to prevent end users from running executables located outside of an IT-approved repository. Because the contents of the repository might change over time, a path-based Allow rule is well-suited for this task. Enter a name for this application-blocking rule. Select Path-based from the Type drop-down list. In the Allow section, select Add to browse to a folder. Enter the path to the folder you want to use as a software repository. This path should use the file structure you created as specified in Prerequisites for Using Application Blocking. For the example in this exercise, we use \\file\software\installers. Notice that an asterisk is automatically appended to the folder path. This wildcard character indicates that all executables in this folder will inherit the Allow rule. Navigate to \\<fileserver>\software\installers and double-click the Notepad++ executable. 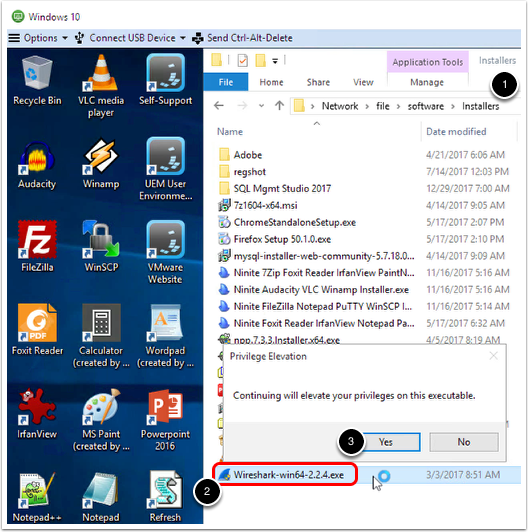 You can copy additional executables to this folder location and verify that application blocking allows them to run from this approved software repository. Important: Disabling application blocking is strongly recommended at this point to avoid having the feature interfere with other exercises. Clear the Enable Application Blocking check box to disable the feature. The following App Blocking video provides a detailed demonstration of the steps for enabling application blocking. If you need additional detail, you can find it here. This video is 5 minutes. With privilege elevation, administrators can now allow end users to run certain applicators as administrators, as well as install their own applications if they meet the specified criteria. IT administrators can create rules that elevate privileges based on a file hash, a software publisher, or a path to a file or folder. The following Configure Privilege Elevation section provides a brief overview of this feature. Credentials for the virtual or physical machine where you installed and performed the initial configuration of the User Environment Manager Management Console, as described in Configure the User Environment Manager Management. Console. Important: The end-user credentials must have Local User privileges to the endpoint device, rather than Local Administrator privileges. 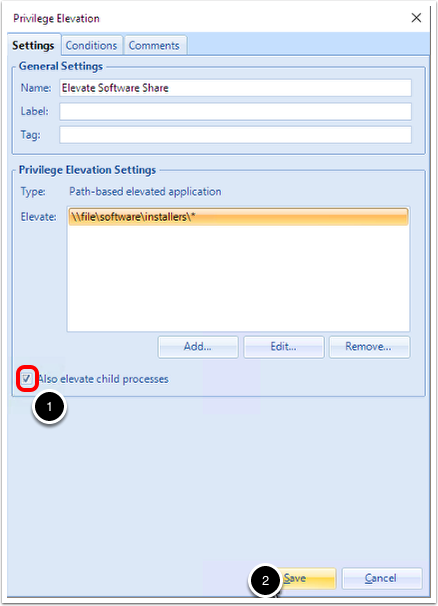 The privilege elevation feature elevates privileges on specific executables, without requiring Local Administrator privileges. One or more executable files with which to test privilege elevation. We recommend downloading WireShark for testing. Starting this file requires Local Administrator privileges. Copy the WireShark file to the installers folder. Important: The Domain Users group, or whichever group you selected in Profile Archives Share Prerequisites, must have read and execute permissions to this file share. Note: Throughout this exercise, you will frequently change between your Windows end-point device, where the User Environment Manager agent (FlexEngine) is installed, and the physical or virtual machine where the Management Console is installed. It is recommended that you simply minimize the unused screen to streamline the testing process. Log in to your Windows end-point device, where the User Environment Manager agent is installed. 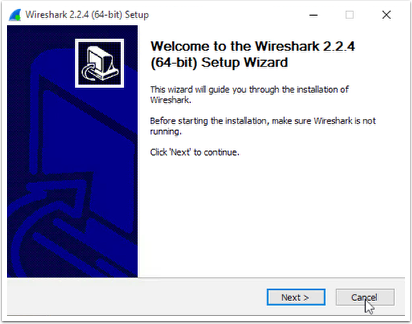 To properly demonstrate privilege elevation, you will verify that privileges for the end-user credentials are insufficient to run the Wireshark installer. Browse to the file share you created. For the example in this exercise, the path is \\file\software\installers. Note that Windows User Account Control prompts you for administrator credentials because the end-user credentials lack the privileges required to run this installer. 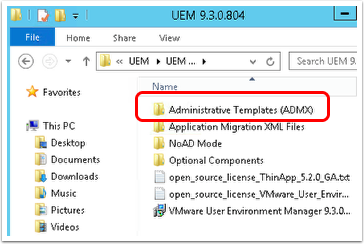 From the Start screen, select the Management Console shortcut in the VMware UEM folder. Select the User Environment tab. Select Also elevate all child processes. This is an optional, global setting that applies only to the case where you enable end users to install applications. This setting is not required to complete this exercise. Select Ask user to elevate. Enter text for Message title and Message text. This notification is displayed to the end user when the privilege elevation feature is invoked. After you select OK a confirmation box appears. Review the disclaimer and select OK to continue. Privilege elevation is now enabled. On the User Environment tab, select Privilege Elevation. Select Create in the toolbar. Privilege elevation operates as a whitelist. In addition to enabling the feature, you must create privilege elevation rules and specify files or folders to elevate. Enter a Name for this privilege elevation rule. Select Path-based elevated application from the Type drop-down list. Select Add to browse to a folder. Browse to or type the path to the file share. For the example in this exercise, all executables in the \\file\software\installers folder will be elevated. Select Also elevate child processes. Select Save to commit the new privilege elevation rule. Open a command-prompt window and run the following command to force FlexEngine to check for updated privilege elevation policies. 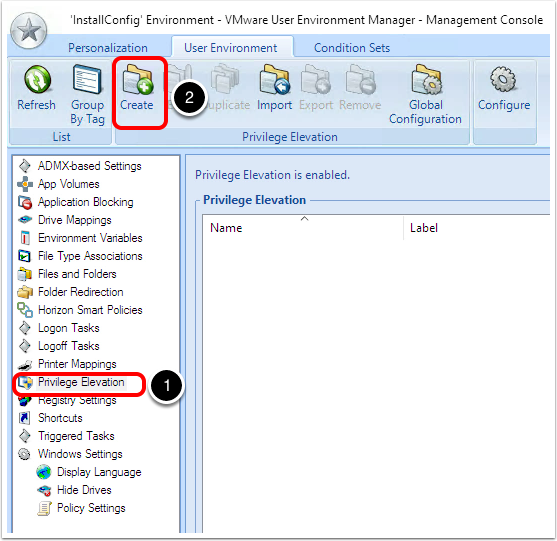 Privilege elevation policy settings are read when a user logs in to Windows or when a triggered task occurs to refresh the policy settings. You can manually refresh the privilege elevation policy settings by running FlexEngine.exe at the command line with the appropriate argument. Browse to the file share you created. In this case, the path is \\file\software\installers. A notification is displayed with the text you entered when configuring the privilege elevation feature. Select Yes to elevate the installer. Notice that the setup wizard starts. 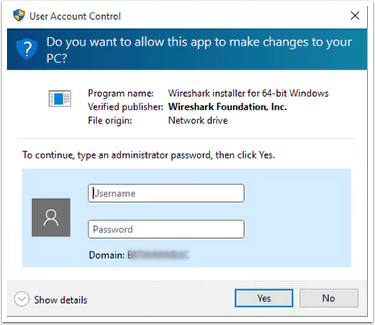 This time, the Wireshark installer runs without the Windows User Account Control prompt for alternate credentials. The following Privilege Elevation video provides a detailed demonstration of the steps outlined in this exercise. If you need additional detail, you can find it here. This video is 2 minutes. In this exercise, you created a single, path-based privilege elevation rule. 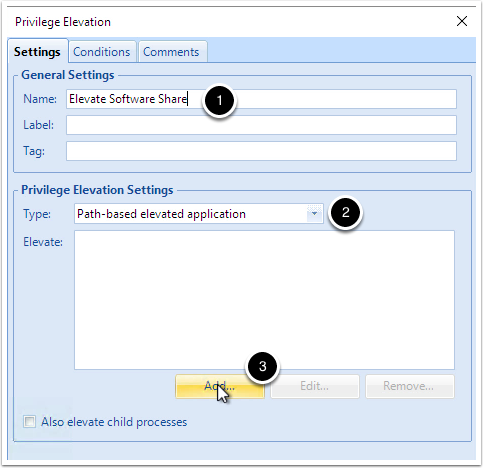 User Environment Manager provides several types of privilege elevation rules, including the ability to elevate executables for applications that have already been installed but that require local administrator privileges to run. 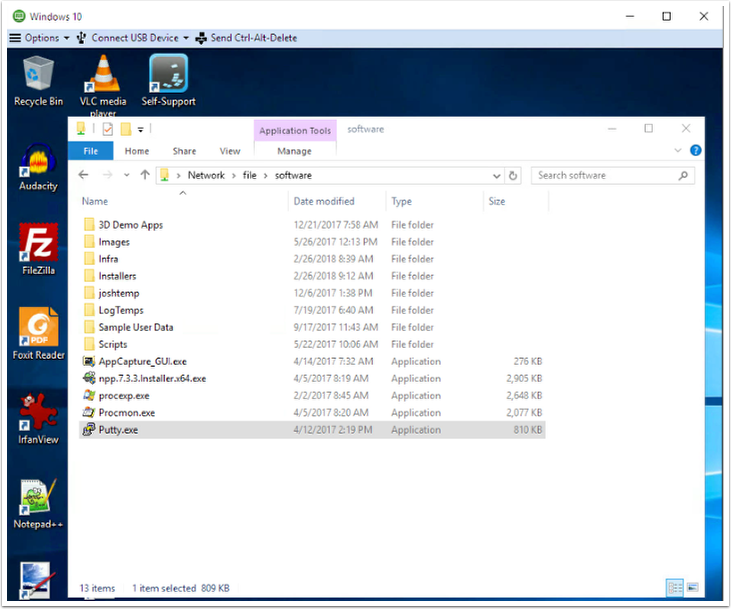 The following User Environment Manager 9.2 - Privilege Elevation Demo video provides demos of several use cases, as well as a brief technical discussion of the way privilege elevation uses Access Tokens in Windows. This video is 8 minutes. This chapter introduces you to the Horizon Smart Policies feature of VMware User Environment Manager, which is included with VMware Horizon 7 Enterprise Edition. The exercises demonstrate the process of creating Horizon Smart Policies and applying them based on conditions such as user group, client device type, pool name, and more. For an overview of Horizon 7, and information about key features, such as publishing applications, creating instant-clone desktops, and more, see the Reviewer's Guide for View in Horizon 7: Overview. What Are Horizon Smart Policies? With Smart Policies, administrators have granular control of a user’s desktop experience. A number of key Horizon 7 features can be dynamically enabled, disabled, or controlled based not only on who the user is, but on the many different variables available through Horizon 7: client device, IP address, pool name, and so on. You can use Smart Policies to enable or disable features including clipboard redirection, USB access, printing, and client drive redirection. For example, you can create a policy so that a desktop login from outside the corporate network results in disabling of security-sensitive features such as cut-and-paste or USB drive access. Additionally, bandwidth profile settings allow you to customize the user experience based on user context and location. Smart Policies can be enforced based on role, and evaluated at login and logout, disconnect and reconnect, and at predetermined refresh intervals. With all these capabilities and fine-grained control, you can use one desktop pool to address many different use cases. Note: In most cases, Smart Policy settings that you configure for remote desktop features in User Environment Manager override any equivalent registry key and group policy settings. 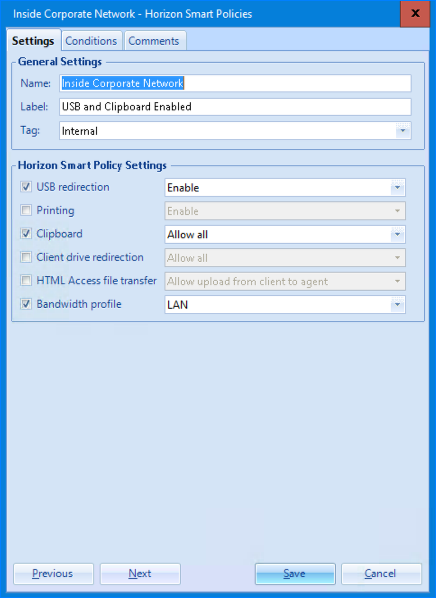 You can use Smart Policies to enable, restrict, or disable Horizon 7 features that include clipboard redirection, USB access, printing, and client drive redirection, and you can select a profile that manages bandwidth usage. USB redirection – Controls whether a user is allowed to use locally attached USB devices, such as thumb flash drives, cameras, and printers, from the remote desktop. Printing – Controls if a user is allowed to print documents from the remote desktop to a network printer or a USB printer that is attached to the client computer. Clipboard – Controls whether users are allowed to copy and paste text and graphics only from the client system to the remote desktop, only from the remote desktop or application to the client system, or both, or neither. Client drive redirection – Controls whether drives and folders on the client system are shared with the remote desktop and, if so, whether they are readable only or readable and writeable. HTML Access file transfer (available with User Environment Manager 9.1 and later) – Controls whether you can upload files from the client system to the remote desktop, download files from the remote desktop to the client system, or both, or neither, when you are using the web client to access the remote desktop. Note that this feature requires Connection Server and Horizon Agent 7.0.1 or later. Bandwidth profile – Prevents the agent (remote desktop) from attempting to transmit data at a higher rate than the link capacity. Note: If you have User Environment Manager 9.1 or later and Horizon Agent 7.0.1 or later, this setting applies when users are using either the Blast Extreme display protocol or the PCoIP display protocol. If you have User Environment Manager 9.0, this setting is called PCoIP Profile and applies only when users are using PCoIP. The actual bit rate for the profiles varies, depending on whether you use the PCoIP or the Blast Extreme display protocol. For this reason, the list of profiles in the menu does not display the bit rate next to the profile name in User Environment Manager 9.1 or later. To create a Smart Policy, you select settings for the Horizon 7 features that you want to control and specify the conditions, if any, under which the policy will go into effect. If you do not specify any conditions, the policy is applied to all users in the user OU configured for User Environment Manager. Settings are always applied when the user logs in. You can optionally configure triggers to also re-evaluate the settings at other times, such as when users reconnect to the desktop or application. If you specify conditions, the policy is applied to users who match the conditions. For users who do not match the conditions, no functionality changes are made to the features. For example, by default, you can copy and paste text from your client system to a remote desktop or application. 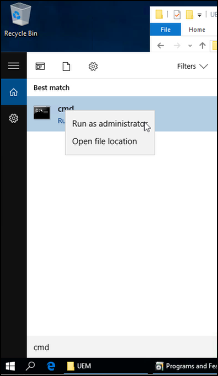 If you create a policy that says clipboard redirection is disabled for a certain group of users, then users outside of this group will still be able to copy and paste text from the client to the remote desktop or application, unless the administrator has used some other method to configure the feature. If you create a Smart Policy but do not select the check box for a feature, then no functionality changes are made to that feature. For example, by default, you can copy and paste text from your client system to a remote desktop or application. 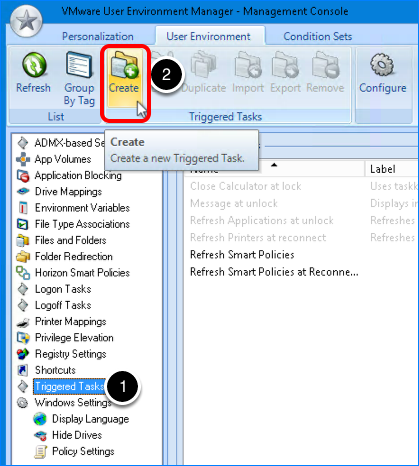 If you create a Smart Policy and do not select the Clipboard check box, the user will continue to be able to copy and paste from the client system to the remote desktop or application. You might notice that the default Smart Policy setting for the Clipboard check box is Allow All, but unless you select the check box, the Allow All setting is not used. That is, the default settings shown for the check boxes do not reflect the default settings used by the features when no policies are applied. User Environment Manager processes multiple policies in alphabetical order based on the policy name. 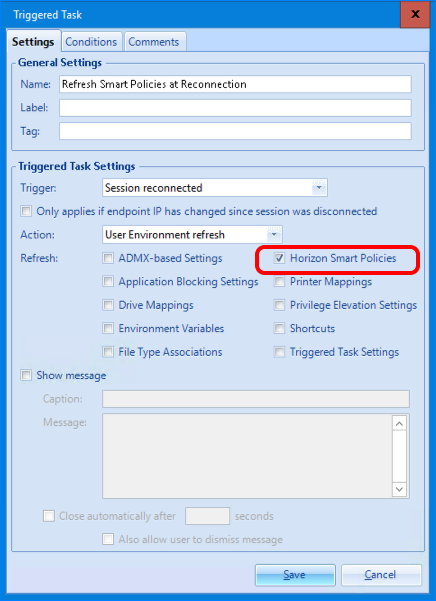 Horizon Smart Policies appear in alphabetical order in the Horizon Smart Policies pane. If policies conflict, the last policy processed takes precedence. In some environments, you might want to strictly control functionality even when no policies are being matched on their conditions and therefore any functionality would normally be left as is. For these environments, create a default policy that sets all features, except the bandwidth profile, to Disabled. Use no conditions so that the policy is always matched, and give the policy a name that begins with “A,” such as A Default Policy. Because policies are evaluated in alphabetical order, this policy will be first in the list and because it has no conditions it will always be matched. 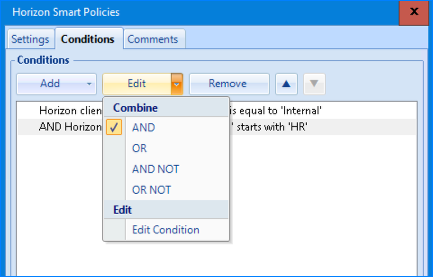 Then create your other policies with conditions to enable or set specific features when those conditions are matched (for example, client location or specific groups of users), as outlined in the exercises that follow. These other policies will be processed after the default policy, and the resultant feature settings will be applied only after all policies have been evaluated. If no policies match, then the default policy will disable all controlled functionality. If another policy matches, then the settings in that policy will override the default policy you created. Now that you have installed and configured User Environment Manager, you can use policy settings that are readily available in the User Environment Manager Management Console. You will enable USB access and clipboard redirection and assign a bandwidth profile. The conditions that must be met for this policy to be applied are that the user must connect from inside the corporate network and must connect to a desktop from the Human Resources (HR) pool. If you want to apply these settings to an actual desktop or application pool in your environment, you must create the desktop or application pool and entitle it to a group of users included in the user OU configured for User Environment Manager. Having an existing pool is not required, however, if you just want to see how the management console works and try creating a policy. In the User Environment Manager Management Console, click the User Environment tab. 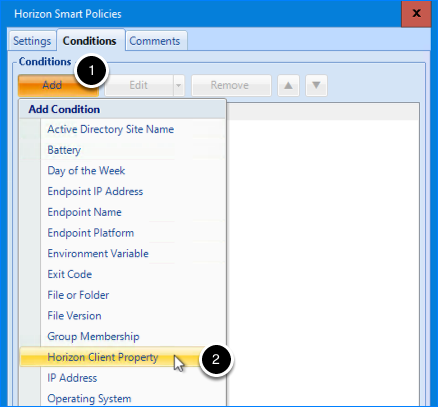 Select Horizon Smart Policies in the left pane. The Label and Tag fields are optional. You can use them to describe or organize the settings. The Group By Tag ribbon button uses the Tag field for grouping the list items. Select the check boxes next to USB redirection, Clipboard, and Bandwidth profile. For Bandwidth profile, select LAN. On the Conditions tab, click Add. For Property, select Client location. Set the location to Internal. This setting is compared with the gatewayLocationproperty set for the server. By default, if you connect directly to a Connection Server, the gateway location is Internal. If you connect to a VMware Unified Access Gateway appliance or Security Server, the gateway location is External by default. If you want to override the default location reported from a server, you can change these defaults by setting the gatewayLocationproperty in the locked.properties file for the server. For instructions, see the Configure the Gateway Location for a View Connection Server or Security Server Host. For Property, select Pool name. Set Starts with to HR (or the first few letters of the name of an actual desktop pool you want to use). By default, this new condition is added with an AND operator, meaning that the condition is applied if the user is connecting from inside the corporate network and if the user is trying to access a desktop pool that begins with the letters you specified. On the Conditions tab, click Edit to see which other operators are available to combine conditions. The Smart Policy settings and conditions are now defined. These settings are always evaluated and applied whenever the user logs in. Next, you will specify an event that triggers the reevaluation of the Smart Policy whenever the user reconnects, rather than logs in. This is called a triggered task. Select Triggered Tasks in the left pane. On the Settings tab, enter a name for the task. For Trigger, select Session reconnected. The Smart Policies will be reevaluated and applied every time the user connects to the remote desktop. For Action, select User Environment refresh. In the list of check boxes that appear after you select User Environment refresh, select the Horizon Smart Policies check box and click Save. Refreshing the user environment in this case means reevaluating the user’s connection characteristics, such as internal or external, and reapplying the Smart Policy appropriately. 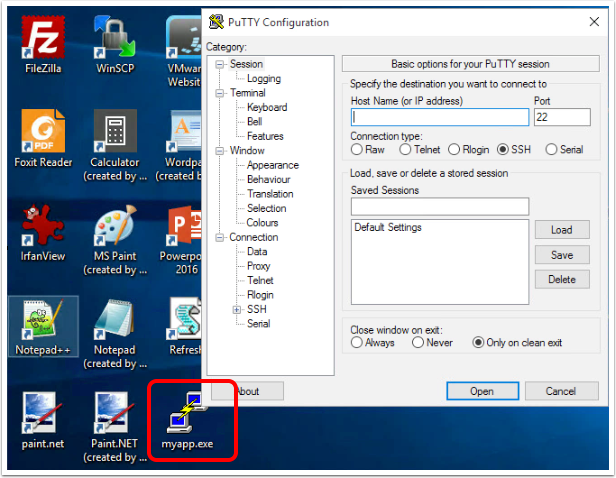 For example, if the user first connects at the office but then later connects from a café or other external network, the Smart Policy is reapplied to disable USB redirection and copying and pasting between the client and remote desktop. In a production environment, you can select additional check boxes, depending on the other User Environment settings you configure. Note: The Privilege Elevation Settings and Triggered Task Settings check boxes were added in User Environment Manager 9.2. Although these features are not part of Smart Policies, they can be used in conjunction with Smart Policies, such as when managing Just-in-Time Desktops and Apps as part of a JMP approach. The Privilege Elevation Settings option refreshes settings for the privilege-elevation feature. With this feature, administrators specify applications that end users are allowed to install or run without having elevated privileges. Standard user accounts can run these applications as if they were a member of the local administrators group. 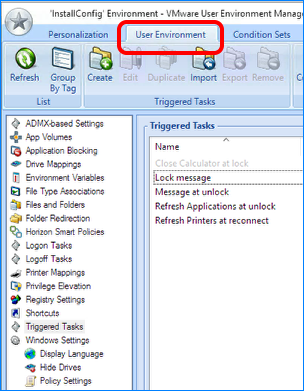 The Triggered Task Settings option allows triggered task settings to be refreshed when users disconnect, reconnect, or lock or unlock their workstation. Previously, these settings were refreshed only after users logged out of the virtual desktop or application. 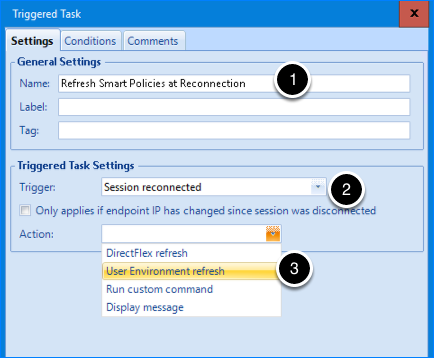 The Smart Policy you created will now be applied whenever a user connects to a remote desktop with Horizon Client. In this exercise, you explore some of the more advanced condition settings. Horizon Client properties give you many variables for evaluating conditions and applying Smart Policies. Some of these properties are provided in drop-down menus in the User Environment Manager Management Console, but many more are available when you enter the property name, which is derived from Windows Registry keys. To view these properties, use Horizon Client to log in to a remote desktop, open the Windows Registry Editor (regedit.exe) on the remote desktop, and go to HKEY_LOCAL_MACHINE\Software\VMware, Inc.\VMware VDM\SessionData\n, where n is the number of the session, as shown in the following figure. When creating Smart Polices, you enter the properties names without the ViewClient_prefix. The SessionData registry setting is created when you log in using Horizon Client or the HTML Access web client. If you log in with HTML Access, fewer properties are listed. In this exercise, you create a Smart Policy that enables all features for a select Active Directory group of users who log in to a server with a specific launch tag and whose remote desktop belongs to a specific domain. Select all the check boxes. For Property, select Launch tag(s). In the second list, select Is equal to. In the text box, enter the tag name HR-Dept. The tag name HR-Dept is a hypothetical name. To create a condition that will actually work in your environment, you must enter a tag name that you have actually assigned to a Connection Server and a desktop pool. For more information about assigning tags, see the topic Restricting Desktop or Application Access in Setting Up Virtual Desktops in Horizon 7. This property is derived from the Windows Registry key called ViewClient_Machine_Domain, which is pictured in Figure 2. You do not enter the ViewClient_ portion of the name. In the text box on the right, enter MyDomain (or the name of an actual domain in your enterprise). Enter a user group name. Click Check Names and select a name. Accept the defaults and click OK.
Click Save. The default operator AND is used to combine the conditions, which is correct for this exercise. 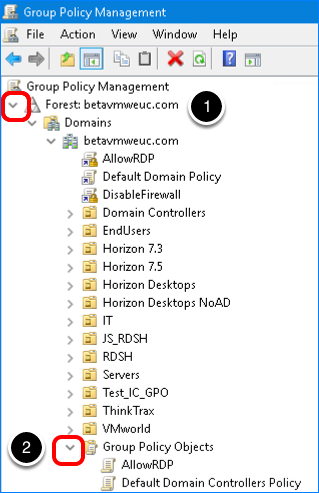 This Smart Policy is set to enable all features and use the LAN bandwidth profile for all users from the Domain Admins user group who connect to a server and desktop assigned the HR-Dept tag and whose remote desktop VM belongs to the specified domain. 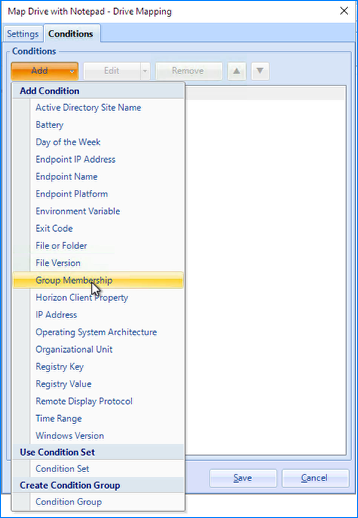 For more information about conditions and client properties, see Adding Conditions to Horizon Policy Definitions in Configuring Remote Desktop Features in Horizon 7. You do not need to create a triggered task because you created a triggered task during the first exercise. In this exercise, you look at the User Environment Manager log to see that a Smart Policy is being evaluated and applied to a particular user. The first four steps of this procedure guide you through setting the logging level using the Group Policy Management Console. Before you can perform these steps, you must have created a FlexEngine GPO, as described in Initial Configuration Using an Active Directory Group Policy Object. If instead you configured User Environment Manager using NoAD mode, you have already set the logging level to Debug, as described in Create the User Environment Manager NoAD Configuration File. In this case, you can skip to Step 5 of this exercise. Type group policy management into the search box on the taskbar. Select Group Policy Management in the results. 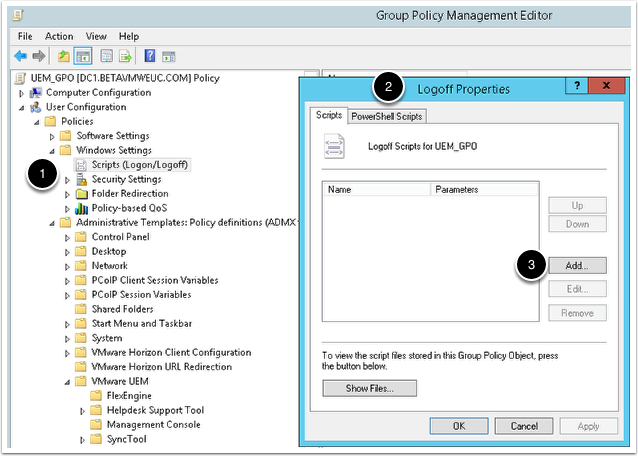 Select the GPO that you created for the User Environment Manager group policy settings. 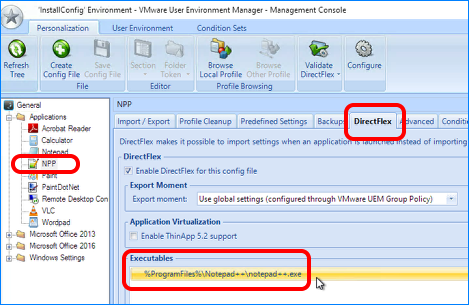 Navigate to User Configuration > Policies > Administrative Templates > VMware UEM > FlexEngine. In the right pane, double-click FlexEngine logging. Verify that logging is set to Enabled. Select Debug as the log level. VMware recommends that you set the log level to Debug only temporarily because the amount of logging can affect performance. Note: This dialog box also shows the location of the log file. You specified the log file location when you installed and set up User Environment Manager. Log in as a user to a virtual desktop that matches the Smart Policy. Logging in will create a User Environment Manager log file for the user. 6. 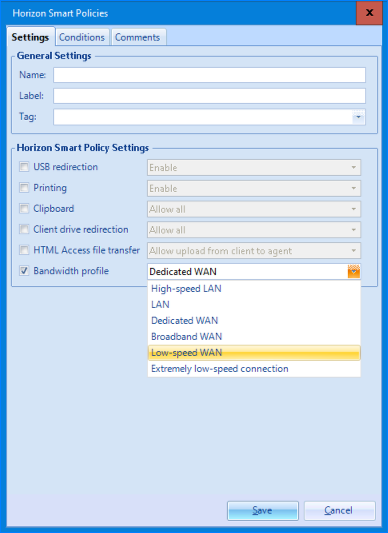 Search the User’s FlexEngine Log File for "Applied Horizon Smart Policies Settings"
On the file share machine, open the user’s FlexEngine log file, and search from the bottom up for Applied Horizon Smart Policies settings. For the example in this exercise, the path to this folder is \\<file-share>\UEM_Profiles\<username>\Archives\Logs. In this example, the user does not meet the conditions for the policy called Internal, so those settings are skipped. Because the Broker_GatewayLocation property is set to External, the Smart Policy called External is applied for all the feature settings. Note: In this example, the user logged in from an external location. You might be performing this exercise from your corporate office, using a desktop or some other test machine, which would be an internal device. This Quick-Start Tutorial introduced you to User Environment Manager and enabled you to set up a proof-of-concept environment through practical exercises. After you have deployed your proof-of-concept implementation, you can explore the product further or plan your production environment by examining Additional Resources. The following terms are used in this tutorial. Instant clone A copy of an existing VM that shares virtual disks with the parent VM, but that, at creation time, shares the memory of the running parent VM from which it is created. Instant-clone desktop A virtual desktop run from a snapshot of a parent VM. An instant-clone desktop is always deleted and re-created when the user logs off. Master image A VM that has been created and configured for desktop deployment and which will serve as the core image for clones. For full clones, the master image is a VM template. For instant clones, the master image is the parent VM plus a selected VM snapshot. The master image can also be referred to as a desktop image, a golden image, or an instant-clone desktop image. Virtual machine A software computer running an operating system or application environment that is backed by the physical resources of a host. For more information about terms, see the VMware Glossary.